Il Best Western Mt. Hood Inn è situato nel centro di Government Camp. L'hotel è vicino alle principali attrazioni turistiche. Approfittate tutto l'anno del miglior prezzo garantito e di offerte esclusive. Benvenuto al Best Western® Mt. Hood Inn!Che la tua località sciistica preferita sia Timberline Lodge o Mt. Hood Meadows, dal nostro hotel di Government Camp potrai raggiungere le migliori piste da sci e snowboard dell'Oregon. Il nostro hotel di Government Camp si trova a pochi minuti dalla località sciistica di Meadows, per permettere agli ospiti di raggiungere le piste con facilità. Mt. Hood è la meta perfetta per gli appassionati di sci e snowboard, nonché per le famiglie che vogliono fare snowtubing. Ci troviamo a una breve distanza in auto da Portland, Oregon, e vicino alle stazioni sciistiche di livello internazionale della zona: per questo così tante persone decidono di soggiornare nella nostra struttura. Il nostro hotel di Government Camp si trova in un'ottima posizione rispetto alle piste da golf e a i luoghi in fare escursioni a piedi, campeggiare e pescare, per questo molti ospiti soggiornano da noi anche durante i mesi estivi. In zona c'è molto da fare durante tutto l'anno, dalle escursioni ai piedi alla pesca. Ci troviamo in una posizione imbattibile e offriamo ai nostri ospiti tutto il meglio del nord-ovest degli Stati Uniti, confort di ottima qualità e un servizio clienti eccellente. I centri di villeggiatura situati vicino al nostro hotel di Government Camp sono molto frequentati dagli abitanti della zona e dai turisti, sia d'inverno che d'estate. Il parco avventura Ski Bowl attira numerosi visitatori: gli amanti delle avventure all'aria aperta devono assolutamente fare un giro sulla zip-line. La zona del lago Trillium è piena di cascate e di specchi d'acqua, la meta perfetta in cui trascorrere una giornata romantica o in cui rinfrescarsi con tutta la famiglia durante i caldi mesi estivi. Vicino al nostro hotel di GovernmentCamp non mancano certo le occasioni di praticare attività all'aria aperta, ma alcuni dei nostri ospiti preferiscono rilassarsi all'interno della proprietà. Dopo una giornata passata a sciare o a camminare, potrai immergerti nella nostra rilassante vasca idromassaggio. I dipendenti dell'autostrada, della Ski Patrol, delle compagnie di trasporto e delle agenzie forestali ci considerano la loro seconda casa. Ci impegniamo ad offrire la miglior sistemazione possibile a tutti gli ospiti, che siano in viaggio per lavoro o per piacere. Prenota una camera e vieni a sciare, a fare escursioni o a pescare al Best Western Mt. Hood Inn! Clean and welcome room. hotel is next to a beer stube with great pizza and other food. Government Camp is a place that has much for tourists with Mt Hood as a backdrop. Fun place to go even without skiing trip. "Blah, a big disappointment "
Hospitality here is non-existent. Front desk was unwelcoming and cold and unwilling to help or apologize for their mistake. The online check-in system is a hoax, they don't have rooms ready on time for the guests who have been asked to tell them what time they will be checking in because of their elite guests get a late check out. It's messed up. Hey BW don't ask guests to hurry to check in at a specific time just to turn them away because you don't even have a room ready. Not the maids fault by the way. The only benefits of staying here? Location is close to Gov't camp and Mt Hood Ski Bowl. The oddly situated breakfast station by the door was well maintained, even tho with powdered eggs. We will find someplace else next time. The morale here kinda bummed us out. The king room was quite large with plenty of space to stretch out and store everything, and the jaccuzi tub in it was a big plus after a night of skiing. Right next door to a great place for dinner, and less than a mile from the slopes. I stayed here last year for the same ski trip. This year the hot tub was jets were not working. The room also had garbage in the kitchen cabinet. The room was great and breakfast was good. I was disappointed that the staff did not try to make amends for problems with room and hot tub. Very clean and friendly staff. Great location to do some snowshoeing, beautiful forest, trails and amazing views. The Best Western was a comfortable, nice place. The staff was wonderful, they even had warm cookies out in the afternoon, really good coffee and hot chocolate as well as tea. The breakfast was perfect to power up for snowshoeing, or skiing if that is your choice. 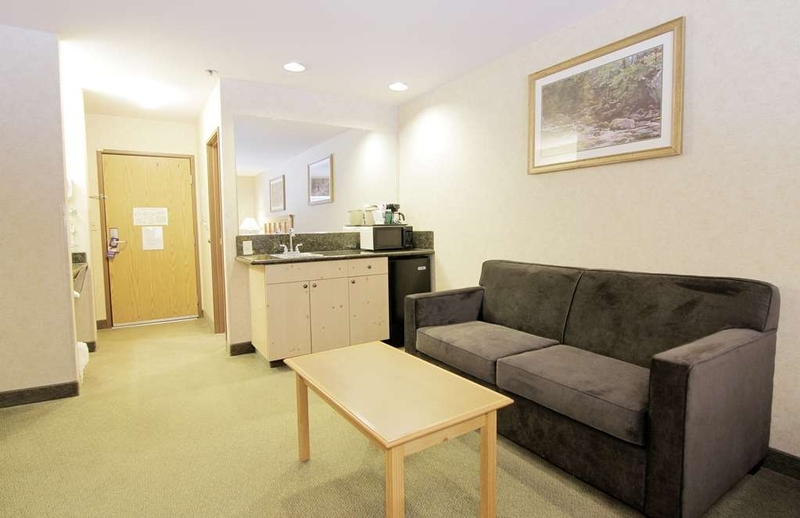 Easy access, comfortable and located within walking distance to most places. Even had covered parking. The Mt. Hood Inn is a wonderful place to stay. We hope to see you again when you are in the area! If you're going to go to multiple resorts on your trip this place is fantastic. It's 20 minutes to Mt Hood Meadows, 12 to Timberline, 3 from Summit, across the street from Ski Bowl... you really can't beat it. Next door to Mt Hood Brewing. The room was clean. The breakfast was one of the best, if not the best, free hotel breakfast I've ever had. If I go back to Mt Hood, I'd stay there again! Great Review, we work very hard at the Mt. Hood Inn to provide a wonderful experience. We can't wait to see you again! This was a great place to stay for our family. The location is amazing; right across the highway from Ski Bowl, and right next to Mt Hood Brewing. The staff was very friendly and accommodating when we asked to move our room closer to another family's room. The breakfast was amazing. It was the best continental breakfast that I've had at a hotel! Looked for place to stay near mt hood. This was perfect clean,great staff, and nice breakfast. Numerous snowshoe trails in the area which is what we where looking for. Right next door was the Mt Hood brewery. We enjoyed beer wine and dinner. We toured the timberline lodge for a few hours on this trip also. Lots of history in the area. "Best deal in MT HOOD AREA"
We are glad you enjoyed your stay at the Mt Hood Inn! Please come see us again soon! We were visiting in town and hadn't booked a place before we came. Upon arrival, the staff greeted us with a friendly smile and even helped us SAVE on our stay! We were able to go up to our room right away (around 2:30) and had a lovely, relaxing night with our family.The breakfast options were beyond our expectations. Delicious, warm and something for everyone. Even our picky eater found foods that he loved.Thank you for making our mini-vacation one that we will remember. We'll definitely stay here again next time we come into town. Thanks for the great Review! We work very hard at the Mt. Hood Inn to provide a wonderful experience. We can't wait to see you again! Enjoyed our stay tremendously. Nice location for hikes and visiting Government Camp. Great Brewery next door with excellent food. They also had a Jacuzzi to relax away the days activities. Overall a great stay. We are so happy your stay was enjoyable. The Mt. Hood Inn is located in a perfect spot to explore our area. We hope to see you again soon! I have spent much more for places not even close to as nice as this. The hotel is in a great location, it's clean, my large room was great and had everything I could need (Fridge, microwave, coffee maker) and the employees were great. The person working the front counter when I checked in this last Saturday evening was an example of what customer service should be. While checking in (in the evening), the person who prepares the breakfast brought out fresh hot chocolate chip cookies for the people who would be checking in. When I went down for breakfast at 6am he was there and just as happy and polite as the evening before. With the Mt. Hood brewpub right next door it is a great block to stay on. I'll be back. Wow, what a wonderful review. We are so happy your stay was awesome! The Mt. Hood Inn has a lot to offer. We are happy you will be back and can't wait to see you! The main purpose we stayed at this location, was it was close to Trillium Lake. The breakfast was average from our experience, fresh fruit, eggs, cereal, yogurts, coffee etc. The staff were friendly and helpful. The room was clean and the bed was firm and provided a good night sleep. Overall a good stay. Trillium Lake is a very popular place. Many people stay at the Mt. Hood Inn to visit the local lakes. It is great you were able to get a great night sleep after a long day at the lake. Hope to see you again! We appreciate you wonderful review. My employees work very hard to provide a great breakfast. There is a minimum amount of words required. However, it is to ensure we receive wonderful content for everyone to read. Don't be discouraged. We love hearing from our guest! Please come see us again. I'm glad I chose this hotel while passing through the Mt. Hood area. 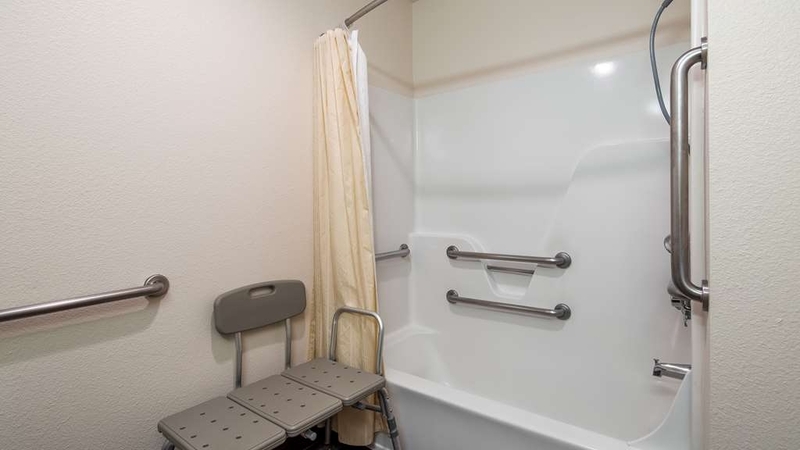 It's more affordable and accessible than the Timberline Lodge. I liked the woodsy decor, and was fortunate to be upgraded to a 'spa room' with its own jacuzzi - good for soothing sore muscles after a day of hiking. Room was super comfortable. The breakfast (included) was fine. Very conveniently located near Mt. Hood area attractions. The front desk staff was nice and tried to be helpful. Only complaint is that the day clerk didn't know where I could buy a warm hat or jacket, even though there is an outfitter right in the middle of town about 2 minutes away. The night clerk had no idea how to work the desktop computers for guests' use; I had to figure it out myself. Those are minor complaints. I really liked this property. The Mt. Hood Inn is a great option for the area based on location to everything. Many hikers like yourself love to come back to our property and relax. We will definitely let all our staff know where to buy outdoor gear. We hope to see you again! Very friendly, helpful young man at the front desk! Clean room, great service. Great location very close to Mt. Hood. Great recommendations for restaurants, sight-seeing, etc. from the front desk person. Super fast check-in process. Very kind and helpfull staff. Very quiet and charm ambiance. I loved the indoor jacuzzi. Very clean and comfortable rooms. Free parking and nice Wifi speed. Delicious breakfast too. 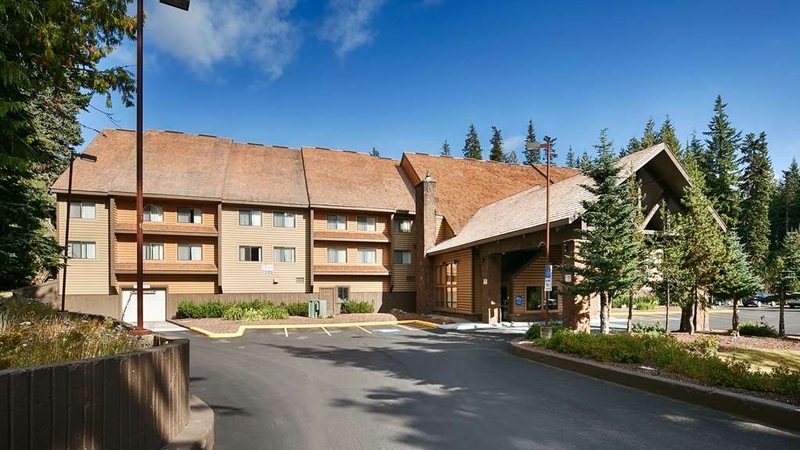 "Good choice when visiting Mt Hood "
Hotel is right by the entrance up to the Mt Hood lodge. Also within .5 mile of ski lift area. Very nice large lobby area. Rooms are good size and all was clean. Good selection at breakfast buffet. We would stay here again. Stopped at the Best Western during an Oregon road trip. Great location, Very helpful staff, clean rooms and a surprisingly good "free" breakfast. Only problem was the breakfast area had limited seating, of course if people had a little common sense they would leave the area to allow others the opportunity to enjoy breakfast. "Good location for Mirror Lake hike"
Excellent location if you plan to hike to Mirror Lake - it's actually close enough to walk to the trailhead from the hotel. The rooms are pretty typical for this type of hotel, as is the included breakfast - scrambled eggs, breakfast meat and breads, all day coffee, fruit, packaged pastries. We really enjoyed the fresh baked chocolate chip cookies at 5 pm! Very nice staff. The bathroom is small, feels dated, and the air conditioning unit is noisy. The Mt Hood Brewing Company restaurant next door is excellent - wish we had gone there both nights we were in the area! The title pretty much sums it up. Good location for summer hiking. Drove to and did the Mirror Hike trail early in the morning before the lot filled up. Also did Old Salmon River, both highly recommended. Checked out the historic Timberlodge and had a decent meal at the Ram's Head bar. As for the room, average BW. Breakfast was lower-end - pre-fab eggs for instance. Lobby had a very strong disinfectant smell when you first walked in. Room was okay though. All-in-all, a recommended place to stay as a summer day-hike base. "Desk Clerk Treated us my crooks"
We have looked into this situation and apologize for any inconvenience. We hope this does not discourage you from staying with us in the future. 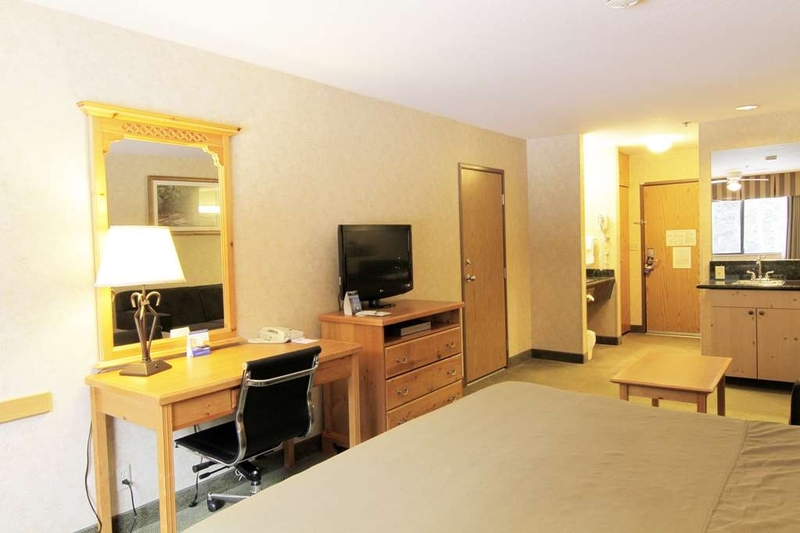 Very nice hotel in a very convenient location, for Mount Hood. This hotel is a solid 4. My favorite things were the free Wi-Fi, free parking, and nice, large hot tub. Room was comfortable. Could use a bit of renovating. Despite what we considered a high price for a basic motel, we were pleased with our stay. The staff were uniformly helpful and gave us good information about the area. The room was clean, quiet and the bed was very comfortable. The standard hot and cold breakfast buffet was kept supplied. The hotel would make a good base for trips up the mountain and to visit the Ski Bowl amusement park in the town. My husband andI enjoyed all of our time at this hotel. Staff was very good and we had not problems at all during our stay except---a small fire at 2 am!! We left hotel and our friends slept through it! The hotel was kind enough to credit us with a full refund for that night. Thank you Best Western!! Spacious room. Staff very friendly. Excellent breakfast. And do not forget the chocolate cookies at 7.00 pm. They were lovely! It is not very likely that we will come back in this area but I certainly recommend this hotel! Our room was immaculate, spacious and very comfortable. Breakfast was excellent with a wide number of choices. Coffee was available any time and it was actually hot! BW has a nice level of quality that we have consistently found at their hotels! I stayed here for two nights. Had reserved with two different sources, so had two room assignments. The manager sorted it out quickly. Excellent full breakfast and modern, very clean rooms and lobby. Fine selection of TV channels, coffee and snacks available all day. Right next to Mt. Hood Brewery with fine craft beer and excellent food. "Great Stay in Government Camp"
We stayed here for one night and found it to be a great stay. The hotel is definitely old (and perhaps not originally a Best Western as it felt more like a lodge set up) but fairly well kept up. A few days before our arrival we had told someone where we were staying and they said that this hotel is the best stay in Government Camp. I don't know if that's true as the resorts nearby certainly looked adorable, but I do think that for this price point this is a really good option. We didn't partake of the full breakfast but the yogurt was worlds better than what is usually included in these hotel breakfasts so maybe there were some other surprises there as well (or maybe not). The staff was friendly and kind and I would stay here again. "Good choice in Government Camp"
This motel is just off of US 26 and relatively easy to find. It is next door to the Mt. Hood Brewing Company restaurant and there are other restaurants nearby. The motel itself is well maintained and clean. The staff was very helpful. We had a large room, with a large desk, 1 luggage rack, a round table, and 2 closets. There were lots of available electrical outlets. There was a microwave, fridge and coffeemaker. The TV had lots of channels to watch. The beds were comfortable, but they were very high - I can't imagine how a child would be able to get into one without having to jump up. The bathroom was small (the sink was outside the bathroom) - not a lot of elbow room. Breakfast was really good - scrambled eggs, premade omelets, sausage, bacon, ham, biscuits & gravy, make your own pancakes, cereal fresh fruit, bread, bagels, yogurt, etc.. The food was always well stocked and there was a large eating area. We wanted to use a BW gift card, but when we left, the computer was down. Maia said she would apply it as soon as the computer came up and she did exactly as she had promised - we had an email receipt by the time we checked our computer that evening. "Comfortable Stay with Great Service"
To be honest, I wasn't expecting much from a Best Western. But, it was recommended on our friend's wedding website and the best-cost option. We were pleasantly surprised. We were greeted enthusiastically by the front-desk guy (I feel really bad that I'm blanking on his name because he was awesome, but I'm terrible with names) who complimented us on our cat-themed shirts (our matching theme was unintended). Everyone who we interacted with at the hotel was super nice. We stayed for three nights, and they answered all our questions efficiently with a big smile the whole time we were there (such as where is a good place to eat? which trails are easy? what should we check out while we're here?). The breakfast was pretty extensive (eggs, bacon, sausage, oatmeal, cereal, yogurt, bread, etc.) and very filling. At 7pm, there are always fresh-baked chocolate chip cookies (I recommend to go at 6:55 just in case there's a mad cookie rush, which happened on our first night there). They were even cool enough to turn the TV to Jeopardy each night so that we could watch and eat our cookies in the lounge. We requested a crib for our baby, and they promptly delivered a Pack n Play, where my daughter slept very comfortably. Our room had a microwave and fridge, which is very useful for preparing baby formula and storing leftovers for the midnight munchies. The only thing that didn't make it 100% perfect is that, while it's a nonsmoking hotel, the elevator and front entrance reeked of smoke. I'm not sure why that is since I never saw anyone smoke, but I'm super sensitive to the scent, so it was definitely there. Also, the wifi kept crapping out on my phone, so I just used my phone data the whole stay. My husband didn't seem to have any trouble, so the issue might just be that my phone is older. Other than that, for the price, I recommend a stay here. "If you can't find other lodgings, you could make do with this." The hotel has no visible signing on the hotel except for a small two foot square blue and white one on a 4"x 4" post set back from the road and the driveway drops so steeply from the main road that you can't see an entrance. Drove right by it the first time. Once at the hotel there is some signing spray painted on the entryway in red paint. Classy. The doors at the entrance need to be automatic as guests are carrying luggage and ski gear. The doors are also only single width and there is another set of doors immediately inside with little room to maneuver once you are in there. Arriving before 4 PM should not incur a $50 early arrival fee and guests should be notified that a $30 hold fee is placed on the cost of the lodging. The double queen rooms are very small. When some is sitting at the desk chair another person can't pass between the person sitting and the end of the bed. The bathroom fan in our room sounded as though it was knocking around chunks of wood, the light over the window table didn't work, the upholstered chairs were very worn. Room supplies such as coffee and new cups, ice bucket liner, soap and toiletries were not replenished nor were our pillows to the beds, they were left piled in the corner after room service. TV Channel line-up card was not available and the one in the room binder didn't match the channel designations on the TV. Breakfast was good except the omelets were refrigerator cold, the fruit bowl was empty, the orange juice dispenser was empty, and the corner arrangement of the hot items only allows one person at a time to access the three hot serving pans. Basically the food service was poorly arranged and not supervised. On a good note, the foam beds were nice. Thank you for your valued feedback. We are always looking for ways to improved and cannot achieve this without our guest input. "Would've given it 5 stars until this hotel threw a wrench in my business plans.."
Breakfast was decent, rooms were cleans and the staff was friendly. However, I had an important video conference call at 12pm on the day of check-out, and check-out is at 11am. I requested late check-out 3 times — once a week before arrival (I left a message that was never answered), once when I checked in (I was told it would be fine), and once on the morning of my call (I was told it'd be no problem). Lo and behold, 11:10am rolls around on check-out day and I get a call from the front desk reminding me I have to check out. I remind them that I requested late check-out and they tell me that's fine, sorry to bother me. Everything seems great until 11:30am when I get another call saying they apologize but they've checked with the head housekeeper, the room is booked and I must check out before 12pm. There are a few things that irritate me about this: 1.) I was told checking out at around 1pm would be fine, not once, not twice, but three times. All of a sudden I had 30 minutes to quickly evacuate the room and find another quiet location with wifi to host an important video business call. Not easy to find a suitable venue in this area. 2.) It took them until an hour before the the fact to realize the room was booked and/or check with the head housekeeper. Unacceptable. 3.) Check-in is at 3pm. I find it hard to believe it would take 2 hours to clean a single room (why not just put a note to save this room for last?) and it just seems ridiculous that they were not more accommodating when they were clearly at fault here. If this is the case they must have a truly inefficient housekeeping team which would explain why someone took my barely used bar of soap and toiletries yesterday but did not replace them. 4.) Really just not good practice to blindside guests like this. If they had just denied late check-out in the first place we wouldn't have this problem. Long story short, this is a nice hotel but do not rely on them to follow through when there's an important matter at hand. I had booked another room in August but ended up cancelling in favour of another hotel after this incident. On a quick trip to bend, needed a stop. The motel provided the neccesities. The bed was fine. Breakfast was better than most motel buffets. met a great family from New jersey. We have stayed there several times and it has been fine. I usually base my reviews on a few important (to me) details...this Best Western came out very average. Location-pretty good. There are other hotels right on this road that are closer to the action and further away from the highway. Cleanliness-pretty good. But, the hotel is a bit on the aged side. Friendliness/Helpfulness - ok. There was one gal who was super chipper and helpful. Everyone else seemed lethargic and like we may have been bothering them. Food - I choose a lot of restaurants that have the breakfast buffet as a part of the price. This one had the buffet, but it was very basic. The only fruit available was a few green bananas. Beds - average beds. A few extra notes - there is not a bar in the hotel. There is not a lot of extra anythings. "Nice room, helpful staff, and great breakfast"
We stayed here while visiting Mount Hood. The guy at the front desk (can't remember his name) was so friendly and helpful. He gave us recommendations for hikes to do in the area which turned out to be very nice. The room was clean and comfortable. I wasn't expecting too much for breakfast but was surprised with eggs and ham with which I made a good egg sandwich on English Muffin. I would stay here again. Really comfortable and convenient to Mt. Hood (15 min drive up the mountain to Timberline). Decent brew restaurant next door. The staff is very friendly and helpful. Rooms are clean and recently redecorated. Four min walk to center of Government Camp. If you are only staying a day or two and are skiing at Timberline, the Timberline Lodge is the most convenient place to be (its mid mountain). More than a day or two, it gets very boring and you'll want to be in town anyway. My only complaint is price. The rates increased since last year, and now its actually more expensive than Timberline (which is a "destination" hotel in the park system). Nice hotel close to Mt Hood, super comfortable beds. Complimentary hot breakfast was good with eggs, pancakes, sausage, etc.There is a restaurant right next door for dinner. Staff was very helpful and friendly. Bed was comfortable, staff are friendly. Room is very clean and quiet. Breakfast is good. I would definitely stay at this hotel next time I'm in the area. Front desk people are very polite and cheerful. I reserved two rooms. We were on the 2nd floor. When my son checked in his room was at the far end where they had been painting- the smell was strong. He asked for a different room. They didn't have one so we traded him. We left the window open when we went to dinner. The hotel was fine - we enjoyed the hot tub, the fireplace and the breakfast. No bar and the place next door was closed. Not that far from town. 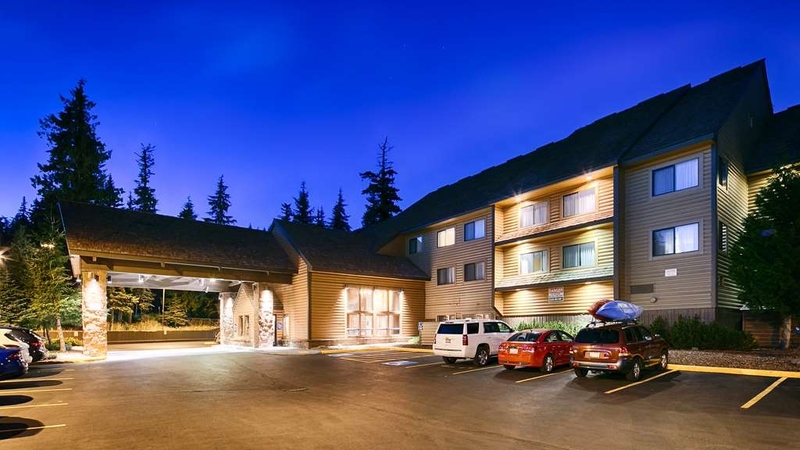 "Convenient location to Mt Hood Meadows"
Good value, closest hotel to Mt Hood Meadows. Very nice room, spacious, nicely decorated, great bed, good wi-fi connection. You could, however, hear noises in the hall and through the walls. Hubby says walls are too thin. Good variety at breakfast. The hotel was in the midst of remodeling, which was't told to us when I reserved our room. There were only a few rooms that were available. We would've stayed here anyway since it was the closest hotel to the ski resort. We were gone during thel day and there was no construction while we were there, so really not a problem. Would recommend this hotel. "It was much better than several years ago"
The wifi was very fast (27Mb/32Mb) that I could video chat and my family could watch youtube at the same time. (The wifi used to be very slow.) The bed was very comfortable and supportive. The room was clean. Though the breakfast still had room for improvement. They didn't have hot scrambled eggs, they only had cold hard boiled eggs. Overall it was an excellent stay for skiing at Mt. Hood. "About the only decent place in Government Camp"
Stayed here a lot and liked it better when it was a little less expensive and there were kids ski race camps staying at the property. Breakfast is good and rooms clean and reasonably well equipped. They recently installed air conditioning which was needed. Ask for a room on the north back side to avoid highway noise. "Like an affordable, mini snow chalet!" This was such a wonderful find...it totally made our trip to the snow so absolutely worth it! We are not snow people by any means but after a long road trip up the Oregon coast we decided to try our hand at snowboarding. Of course we went to Mt Hood since we didn't know where to start. We had been camping and don't stay often in hotels. Most campgrounds were closed this time of year and all the local B&B's and private rooms and hotels were charging outrageous prices as it was also spring break. I tried everywhere but nothing was less than $100 to start and most places were minimum around $150 per night and we would still have to find our way to the mountain. 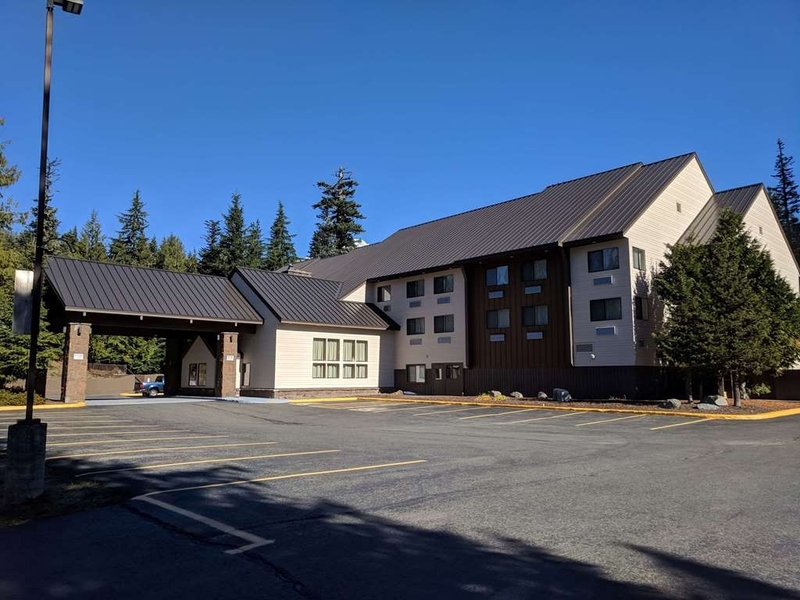 I found the BW Mt Hood Inn on Priceline and thought it was a mistake that the price was only $99 and it was just across from the Ski Bowl at the base of Mt Hood. I called the Inn and asked for a price match wich they couldn't do because Priceline was just too good a price. The lady on the phone was very nice and the room sounded lile a normal room so I decided to book online so we could have our ski day. I could not believe how awesome this hotel was! We immediately felt like we were in a little ski chalet! Snow was up to the windows but inside was a nice fire and warm hospitality! The girl at the desk, Emmy, was super nice and kept offering cookies and fresh brewed coffee to guests checking in! The lobby was clean and comfortable and was also the breakfast area but it didn't feel weird. It had a cozy, bustling feel in the morning and such a warm relaxed feel at night with chairs by the fire. 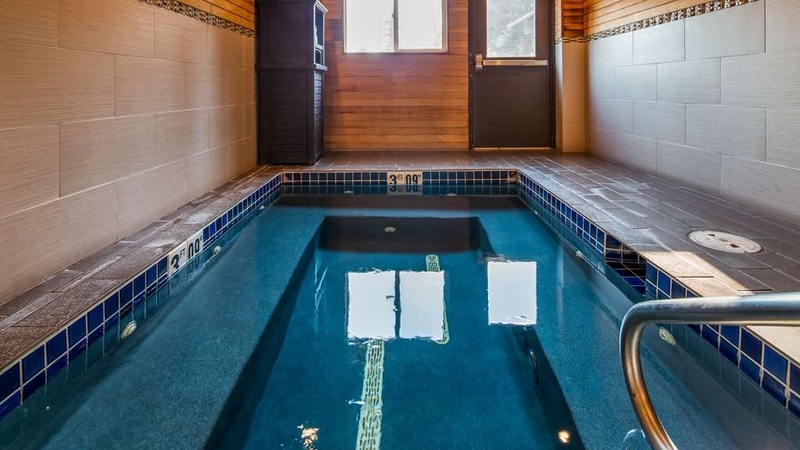 Dowmstairs is an indoor hot tub just large enough to swim and upstairs, a fitness room. Computers in lobby for business. Free and fast in room wifi too. Our room was so comfortable, 2 queen beds perfectly firm and cozy, fridge, microwave, hair dryer and bathroom with tub. We had a view of parking lot which was also a view of the East Ski Bowl which was so beautiful at night! Free hot breakfast was offered during 6-10am. Finally, breakfast offered during respectable hours! The breakfast was pretty good with lots to choose from: scrambled eggs and sausage, pancakes with lots of toppings, cereal, toast, bagles, pastries, yogurt and boiled eggs. Tea, coffee and cocoa too! I couldn't think of anything negative about this hotel. If I had to nitpick I would say the bathroom was small but it wasn't an issue. This hotel was an amazing find and totally allowed us to have a great ski adventure! The ski bowl is only for night skiing except on the weekends but there are lots of snow parks nearby and the front desk offered flyers for all the slopes near by and bus schedules and discounts to certain lifts so make sure to ask up front. My very first time in Oregon was made perfect thanks to this hotel. Quiet hotel if you go on a Monday/Tuesday! Stayed 4 nights to ski at Mt. Hood Meadows and was impressed from the first moments of the trip as we were greeted by Mike, a genuine and friendly man who quickly became a huge & honest help during the entirety of our stay! He guided us where to ski, how to get there, where to eat and everything else in town! He even continued to be helpful for things like a forgotten charger! Very thankful to have been checked in by this guy, it truly made the stay more perfect than I could've imagined!!!! "An Excellent place to stay on Mt. Hood!!" 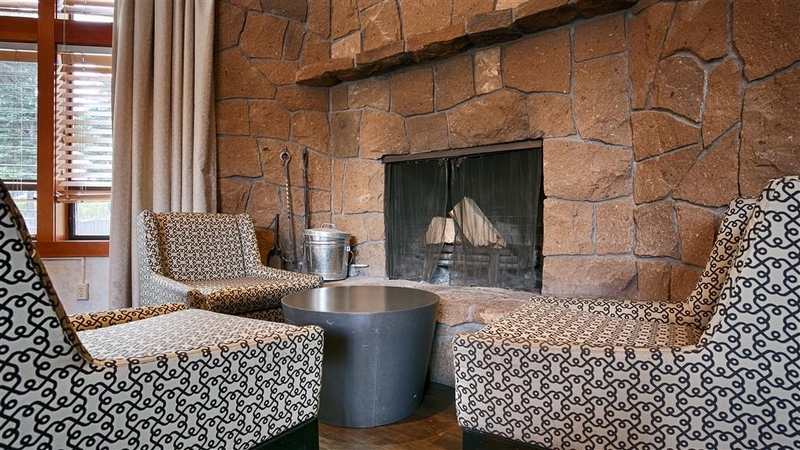 The staff were more than accommodating and the lobby was very clean with a nice warm fire going in the fireplace! Our room was just as clean and the beds were comfortable! Thank You for a Pleasurable stay on Mt. Hood!! I gave 5 stars as a comparison for the class of hotel. It is not in the same class as Timberline Lodge, and places like that. Its location in Government Camp is great. It is very quiet, with very nice rooms. The staff is outstanding. So helpful, pleasant, and professional. 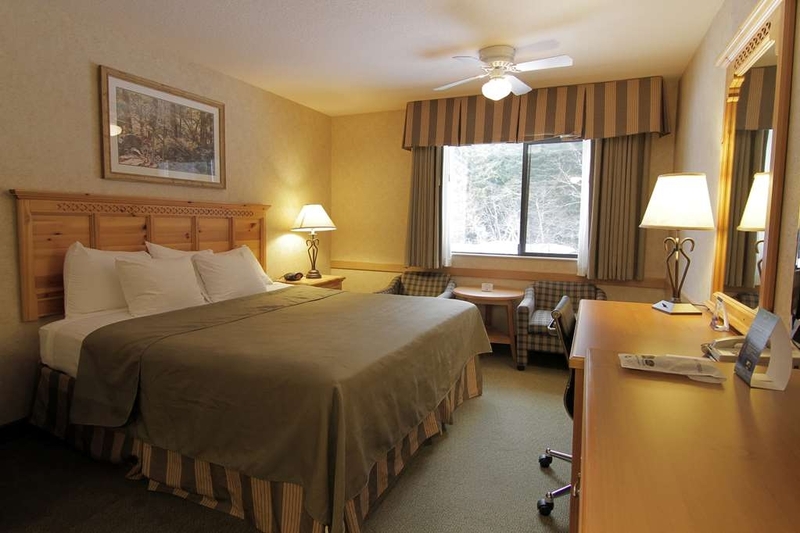 This hotel backs a great home base for exploring the area, skiing, snowshoeing, etc. It also has covered parking. A real plus in snowy or rainy weather. The only negative was breakfeast. Nothing special, just average. At 5:00 they put out homemade chocolate chip cookies. Yummy. Only wish they had some milk to go with them. The rooms on the top floor facing the forest are definitely the nicest. Looking out as the snow covered trees (versus the parking lot) is really cool. We truly appreciate hearing wonderful feedback. We thank you for staying with us and hope you come back soon! Mike was very nice and helpful, pleasant. Everything was good. I've been here quite a few times and it's always been nice. We like how convenient the hotel is to everything, minutes to skibowl. We would definitely be back. Thank you for taking the time to write a review. I will pass the compliment on to Mike. Hope to see you again soon. I appreciate a clean room.. and the staff spin check in was friendly and cheerful! :) but seriously folks..! We're in an $80 room, paying $250?! There is absolutely NO good reason other than we were swindled. A ‘nice' room? No, a large room? Nope, whirlpool tub? Nope we were simply charged a ridiculous rate for a small, lame, $80 at very best(!) place to crash... and I'm thinking of all the ways I could've spent that cash... never again. Best Western, you're just like every other greedy shmuck out to make a buck. iamtriana. When booking a room, it is best to book as far in advance as possible. Also take advantage of our Best Western rewards program that we offer. The rewards rate is usually our lowest rate available. "Room not serviced - empty pizza box in dresser"
I haven't stayed at a Best Western property in quite some time; not sure I'll be doing it again any time soon. Our room was not serviced during our stay. I reported it and was told that I must have left on the Do Not Disturb sign (which, I didn't). Further, there was an empty pizza box with half-eaten pizza crust inside our dresser from previous occupants as well as some random pennies on the bed. The breakfast ran out the first day and was sloppy the next. Beds were actually decent though and our room was quiet at night. It does basically share a parking lot with a cool brewery/restaurant which we enjoyed, but that is not the hotel's doing. H5816FOsarahs Thank you for choosing the Mt Hood Inn for your lodging needs. We apologize that your stay was less than excellent. Please consider staying with us again. 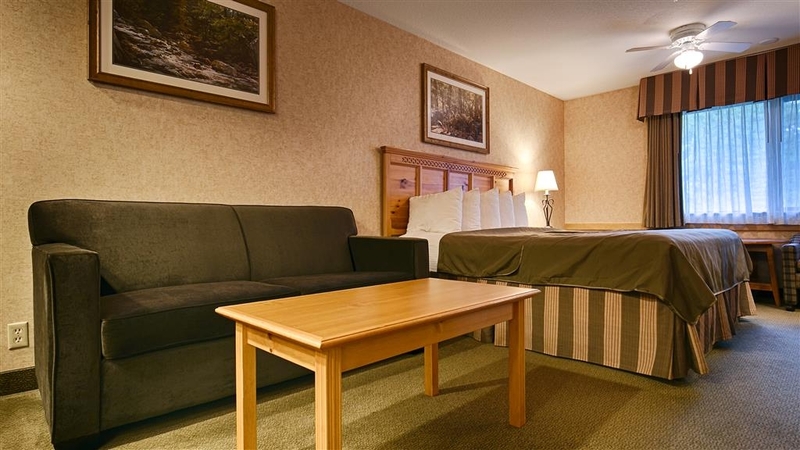 "Excellent stay at Mt Hood BW"
Friendly and helpful staff. Clean and tidy rooms. Lots of options at morning breakfast buffet. Clean hot tub and gym area. Great location to close by restaurants and shops in town within walking distance. Stroudsquad. Thank you for the review. See you again soon. "Nice Hotel but a little expensive for what you get." The hotel is nice but a bit pricey for the level of accommodations received. Some of the staff was great and half was just not up to par. With that said, you cannot beat the location and having a garage! falvaradob. Thank you for taking the time to leave a review. We always suggest booking as far in advance as you can to get the best rate. Hope to see you in the near future. Negligent staff, unreliable internet, dirty common areas and messy breakfast. Initial room that was assigned had terrible odor. Lobby wasn't clean and the common restroom was disgusting. The young man at the front desk the entire time couldn't have been ruder. Sue P. On behalf of the entire staff, I apologize that your stay did not meet your satisfaction. Consider staying with us again so that we have the opportunity to better your perception of our establishment. "Very nice place to stay if skiing or tubing." We stayed here for one night as we were taking our kids cosmic tubing at night at the adventure park at Ski Bowl. The hotel has a very tight but covered parking garage that has about a dozen spots and outdoor parking as well. It was starting to snow hard when we arrived so we parked in the garage and then walked to the government camp village which took about 15 minutes, very nice walk. There are also shuttles coming and going in the area. The next day most of the cars were buried in snow and the owners had to dig them out. Glad we grabbed one of the indoor spots. They're usually gone by evening so park early if you don't plan on driving anywhere else. The hotel has an older feel but seems to be maintained well. There is no pool but a hot tub that seats about 8 people. It was not hot at all, more like tepid bath water which I hate. It was so cold outside it would have been great to have it hot but no luck. The free breakfast however is great. Scrambled eggs, sausage, biscuits and gravy, pancakes, oatmeal, cereal, yogurt, juice and coffee. We enjoyed our stay here but would probably stay closer to the village next time. gldnby. Thank you for taking the time to write a review. Hope to see you again. "Good place to sleep not eat"
Thank you for the review Ellened2. The room was great. Unfortunate that there were kids running up and down the hallway until almost midnight. I blame poor parenting but even more so staff which could have and should have insisted guests keep their noise under control. Rugbyduck. On behalf of our entire team, I would like to apologize for not exceeding your expectations. Your satisfaction is important to us and we will be using the feedback you gave us to implement improvements to ensure we offer a better experience for guests in the future. I hope that you will consider staying with us again so that we can have another chance to provide you with a superior experience. Very nice staff. Great location. Hot tub was nice. They called after we got settled in our room to check if we needed anything. Later in our stay there was an issue and they were very eager to correct the issue. Zoe was great at the front desk. There is a small garage for parking which was nice given the snow. dashiavu. Thank you for your review and for allowing us to correct the issue during your stay. Most concerns are brought to our attention after check-out. We want our guests to have a great stay. Come back to see us again soon. "Even under renovations it was a great experience"
First thing we noticed was renovating. Second thing we noticed was superior customer service and warm ,friendly welcoming staff! The room was spacious, clean, well appointed and super comfy. The next morning breakfast was delicious. We are already planning our next trip. We loved it just for a getaway! Mokihana J. Thank you so much for the review. Make sure that you are a rewards member so that you can earn points for your stay. See you soon. Bathroom was small, but otherwise the room was pretty quiet and had stunning views of Mt Hood. We arrived as 2"+ of snow was falling. We had the chance to park inside where there were a few spots left. Cable didn't have many channels, but wifi was free which helped. katiebE8669MW. Thank you for the review. We are working on receiving more channels from our satellite provider. You should come back to visit the area when the snow starts to fall by the feet. It truly is an amazing sight. "Nice rooms in a great setting!" We book the king Jacuzzi room and it was great! nice and clean and the tub was inviting! the only issue we had was when we first started up the Jacuzzi the smell of rotten eggs filled the room but it went away fast. Chad G. Thank you for the review. The smell that you are referring to is the concentration of sulfur in the water. Well water coupled with our close proximity to a volcano are the culprit. Luckily, it's a brief, random occurence. "Govt. Camp one night stay"
Drove around Timberline Lodge area and stayed one night here. The town is small and not much was open. Did enjoy some time in the Visitor Center. The outside of the hotel was getting a face lift. tricky to get in the entrance, but I am sure that is completed by now. Staff was friendly and bed was comfortable. Great brewery (owned by Timberline Lodge, so menu is similar) with good food next door. Nice to walk to dinner! Maresha. Thank you for the review. Come back and see us soon. "Great place and terrific staff"
The place is being remodeled and is beautiful. Great location and terrific staff. Enjoyable breakfast. The rooms are clean and well kept. I highly recommend this place. There are good restaurants within walking distance. lasydoc. Thank you for taking the time to write a review. I will share your kind words with our staff. Hope to see you again soon. Easy check-in, clean rooms, good location and the breakfast was wonderful. The morning breakfast person was awesome, he kept things tidy, and was quick to get items that weren't available unless you asked. mrgaringer. Thank you for the review. Our employees appreciate when their efforts are noticed. Hope to see you again. Under construction. That alone we could have lived with but the room was not clean. Food on the floor, someone's bracelet under a chair. Housekeeping fell down on this one. 100 degrees outside and no A/C. A hand written sign advised all "there will be no compensation for any inconveniences". We were charged extra for the first night and can only assume that was because they knew we would check out early. We did. Called Best Western customer service and they told us they were not aware of the remodel. Mark P. Our remodel is part of a Best Western corporate improvement plan. The customer service rep that you spoke to may not have been aware, but the information was posted on our Best Western website. Because of our location, air conditioning was not included in the building. We do experience a week of hot weather in the Summer and because of this, we included guest room air conditioning as part of our remodel. We are now the only hotel in Govey with a/c in the guest rooms. See you again next year. "Great staff, clean rooms, excellent location, decent price"
First of all, Mike at the front desk was one of the nicest and helpful guys. We arrived and he greeted us with treats. When our room's bathtub did not drain he ensured we got into a new room and he helped move us. The next day the manager Zoe was also helpful as she knew we had issues and comped us the night. Great place, would stay here again. Susan M. We are not immune to issues that may plague buildings. I'm glad we were able to resolve the issues to your satisfaction. This is an excellent hotel driven by friendly and engaged staff who anticipate guest concerns and who are available to meet the needs of guests. The rooms were stellar. Nice amenities. Big beds. Clean linens. Plentiful items on the breakfast menu. thomaselisabethb. Thank you for the review. Our employees love it when their efforts are recognized. "Good Bed and Quite Room"
The room was quite, clean and had the things we expect, good bed and four pillows, frig, microwave, a table with chairs, plenty of places to charge your phones. The hotel is very close to mount Hood and the Timberline Lodge which has an excellent lunch buffet. johnaR2596JI. Thank you for the review. Our location has something for everyone. Hope to see you again soon. Dennis P. We are happy that you enjoyed your stay with us. Come back to see us soon. "Beyond Bad - Stay Away!" This hotel - at least the rooms directly in the active renovation zone, should not have even been open during the renovation of the exterior. We got in late at night and couldn't even believe this place was open. The loud, intrusive renovation construction affected most guest rooms. Our room was located in the center of this renovation zone. The construction appeared to consist of replacing siding. Workmen on lifts were just outside our window, peering into our room at 8:30AM. One even grinned at me as I closed the curtain. They drilled into the wall between the outside wall and our room at making any conversation impossible (much less sleeping, had we been trying to do so). Additionally, the carpet was filthy beyond anything I've seen before in a hotel. When I complained to the manager on duty about the construction and crew, he went on and on about not having any control over it, it was an upper management issue, and there was nothing he could do about it. It was one of the worst cases of an uncaring and unapologetic response to a complaint I've ever experienced. During the reservation process, potential guests should be appraised of active construction and renovation that might impact them. What a terribly-run hotel and awful experience! Greg F. If you had made your reservation directly with the hotel, we would have informed you about the siding currently being affixed to the building's exterior. Our website also includes some info. When you book through a third-party, information like that is lost. We do what we can to make our guest's stay as comfortable as possible. This place is awful. We are stuck here after a long road trip unable to use the sinks or the shower as there is a problem with water. We have been here for 6 hours and this issue has not yet been resolved and won't be tonight. Sorry but this just isn't good enough. The icing on the cake was the manager telling me that she would be up all night sorting the situation. ....am I meant to feel sorry for her? Bet she gets a shower in the morning. Eileen F. We are in the middle of the Mt Hood National Forest. One of our main water pumps broke. It was repaired. You were inconvenienced. We did apologize and comped your stay. "The Kind of Place That Should Be $80-90 a Night, Not $150"
The beds were comfortable and the bedding clean but the carpet left a lot to be desired. I'm not sure how we got so much road noise. We were on the Northwest corner of the building which was almost as far from the freeway as we could get but still got a lot of noise late into the night. When our key cards kept failing we heard all the normal excuses like 'you must have had it near your phone' or 'did you place it next to a chip card in your wallet?'. Neither of these things were true in my case. After they gave us a card to clean the reader with (isn't this something maintenance should do?) my friend's card only failed one more time. There was some significant remodeling going on when we were there but the crew was considerate and polite so we didn't have any issues with that. I just checked in to a hot tub king here. Mike at the front desk went above and beyond to make us happy. The woman before me took the last cookie and he offered to make more. He offered me a towel for cleaning and got me a wine opener. Whatever I asked he delivered with a smile. The room was perfect despite the outside construction. I highly recommend this hotel. Mycirus. Thank you for the review. I will share your compliments with Mike. Btw, we think he's pretty awesome too. Come back and see us again. The staff at the hotel were great! the property was under construction so this took away from the feel of the hotel. Breakfast was average but there was breakfast so that was nice. Rooms were fine. I would not seek this hotel out we were there for a wedding and it was one of the few places to stay in the area. But overall the experience was fine. We drove up outside and wondered if they were open because they are remodeling but it made no difference for our stay. Both people we spoke with at the front desk were very welcoming and helpful. They were quite knowledgeable of the areas including the hiking trails and other things to do. April H. Thank you for taking the time to post your review. Our exterior may not be much to look at, but it does not affect the hospitality that you will experience here. No issues with construction at all. Hotel was quiet, comfortable and the staff was very friendly. The parking lot was safe, and this hotel is feet from an amazing brewery. We will definitely be back! Thank you! 123kd123. Thank you for the review. Do you like to snowshoe? It's a very common activity here in the winter. It gives you a different view of the Summer hiking trails. See you again soon. 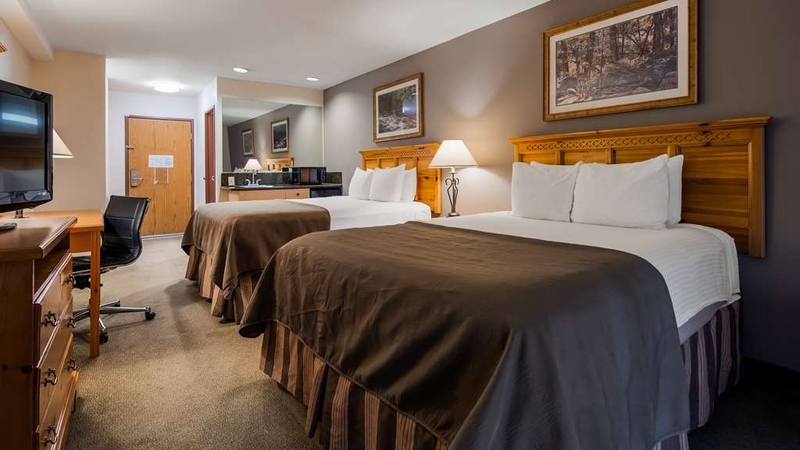 Very nice, clean hotel with comfortable beds, located in the heart of Mt. Hood recreation areas. Rooms were spacious and well appointed. Easily walkable to local places of interest and drivable to others. karinv472. Thank you for your review. We love our location. There really is something for everyone here. Hope to see you again soon. This place may work great for your trip, but you should know what you're buying before making your reservation here. Unfortunately, the scope of the construction here isn't clearly conveyed anywhere, and you will almost certainly be surprised by how extensive the construction is when you pull in to the parking lot (assuming heavy equipment isn't blocking your entry to the parking lot). The whole roof is being replaced. The entire facade of the building is being removed. They are putting AC units in all the rooms. They have heavy machinery blocking access to the hotel itself with no signs indicating how to get to registration or the parking lot. They have heavy machinery right outside your hotel window too. Inside the hotel, there are piles of ripped off boards with exposed nails on the ground - a safety hazard for anyone, but especially curious kids if you're bringing some. Again, hotels have to renovate and I'm sure this place will look great when it's done. Still, it would have made more sense to work on half the building at one time, not set construction hours that run to 9 pm, and not charged full price during this extensive construction project. Barring any of that, any sort of hospitality along the lines of "We realize our hotel is a mess, but we'll make it up to with X Y Z during your stay" might have gone a long way. As it is, we left after only one night and will not be coming back any time soon, renovated or not. foreverkmo. This is the first I've heard of loose boards inside of the building. I am aware that some window sills are being replaced, but the construction crew has kept their workspaces tidy. The interior of the guest rooms are construction-free and each guest room has air conditioners installed. We do our best to make our guest's stay as comfortable as possible. Very polite and helpful staff. Quaint town with numerous eateries. Close to My Hood and Portland. Rooms and facility was clean. Some covered parking with security. If you are traveling in the area this is a nice place to stay. glennp871 Thank you for the review. There really is something for everyone in this quaint little town. The hotel is fine, staff very nice, away from the village but and easy stroll. Rooms have been renovated recently, breakfast is typical but good coffee. Next to a great brewery. Parking is tight and seems like not enough spaces but we managed. Laurie F Thank you for the review. Hope to see you again! When we first pulled up to the hotel, we were very surprised to discover that the building is an active construction site. There's a curt note at the front desk basically saying "It'll be noisy and dusty here every day from dawn to dusk and if you don't like it go somewhere else" but that's hardly doable when you're arriving at 7:00pm after a long day of driving and have no idea what the alternatives are, and no energy to go exploring. Their note also claims that their website warned us it'd be like this, but we didn't see any such warning, and neither did any of the other equally dismayed travelers who came to the front desk while we were within earshot. It's inexcusable that they'd charge full price for such substandard lodging, and without making a genuine effort to let people know what they're getting themselves into. It turned out to be tolerable, or at least more tolerable than we expected after our initial chagrin, but we definitely wouldn't recommend staying there until the construction is completed, unless absolutely nothing else is available. "We cancelled our second night!" We were dismayed when we drove past the hotel before mid-day and noted the appearance of the hotel. why weren't we informed that building work was taking place. The most uncaring front desk we have had on our US road trip.He wasnt even prepared to show us the room (the outside had "scaffolding" up it) Breakfast was a disaster, 7:00 am and the waffle machine mixture was empty, it took 20 minutes to put a new bag in! Toaster was broke. We were so pleased we cancelled our second night! Alan M. We strive to make our guest's stay as comfortable as possible. Our website clearly states that we are under construction. Though, honestly, right now, it is just the exterior siding that is being replaced. As for our pancake machine, the batter must be made fresh and it does take some time to mix it correctly. (no one wants lumpy pancakes). When we pulled in, we noticed they were renovating, which we knew in advance. The Libby is very quaint and lodge-y with a nice stone fireplace. The staff welcomed us with smiles and couldn't have been nicer. We got settled in our room and about an hour later got a phone call checking on how the room dirt our needs. Zoey even ran a roll of toilet paper up when we were almost out! Now THAT's service! Breakfast options were good, even had a sign for gluten free and dairy free options upon request, which is great for people like me who can't have either. Breakfast time can get a little crowded but still a nice area. I think the only complaint s we had was the showers weren't made for tall people and the water pressure kept changing. And the carpet really needed to be replaced, stains were quite visible. They could definitely fit 2 king beds in our room and still have room to walk around without a problem. We'd definitely stay here again. So currently this is an older hotel in the midst of upgrades. So your current room may not be updated yet. Our room while fairly spacious was not yet updated with AC or other features but was comfortable. The on-site laundry was a nice feature after being out and about on Mt. Hood. The complimentary "breakfast" was good and I'd say above average to other's I've seen recently. The location is great; Government Camp has a nice vibe, with a great general store and a number of decent casual dinning locations. The proximity to Timber Line Lodge on Mt. Hood could not be better. So it should be an above average place once the upgrades and renovations are complete. The hotel is in the middle of updating. Room air-conditioning, new windows, new siding. 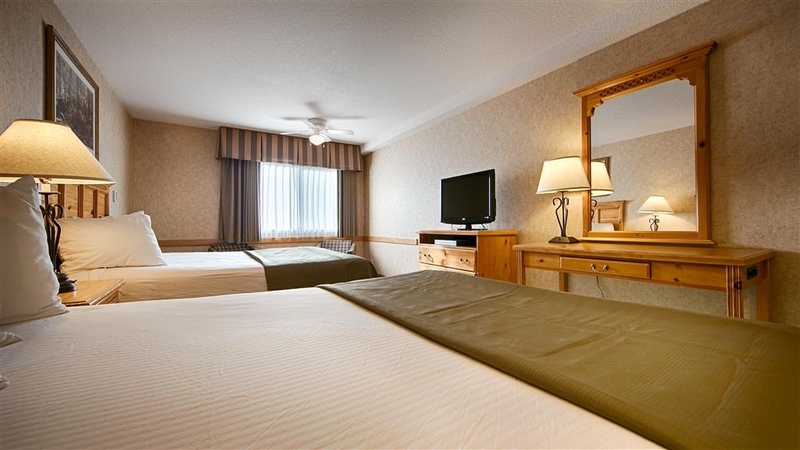 Comfortable room, newly updated, good a/c, comfortable beds, clean rooms and bathrooms. Friendly staff, breakfast is taken away too abruptly. Front desk very welcoming and helpful. I'd stay here again. "Don't judge a book by the cover, under construction but great inside"
Even with the construction it was a great stay. It made parking a little inconvient when we pulled in late, but definitely no reason to not enjoy the inside of the hotel. I didn't have time to check out the amenities since i was busy at the lodge up the mountain for a wedding, but definitely was a great crash pad in between family events. Location is great, easy to find right off the main highway. The breakfast was satisfying, cute pancake topping bar, lots of options, oatmeals cereals yogurts breads fruits juices and milks even with eggs and sausage and bacon. Came during the hottest week of the year and the fans in the room kept it cool, no complaints. Mercedes_blad. Thank you for taking the time to review our hotel. Parking outside is a difficult task during our winter months, too. Most of our exterior lot gets occupied by feet upon feet of snow. Our parking garage comes in handy then and, luckily, also during this time of construction. We are happy that you enjoyed your stay and hopefully you want to come back and see us. I see some snowshoeing in your future. Wasnt disclosed that they were under renovation and price was too high, carpet old and appeared dirty, low water flow in sink and shower, some breakfast items were not hot as they were meant to be, noisy, stuffy in the room. No additional comments past what I previously made. David T. I apologize that your stay did not meet your expectations. Our website lists that we are currently under renovation. As for the rates, we are very busy during the Summer and they reflect that. We do our best to make our guests comfortable. "Going thru construction now, had a few problems, but..."
Pauline L Again, we apologize for the events that occurred during your stay. Unfortunately, we do not have control over accidents like this, but we can do what we can to address and fix the issue. Come back and see us again. We had 2 adjoining rooms for a family vacation touring the US. The rooms were a decent size, comfortable beds, quite modern. Breakfast was decent, but nothing ever changed, so a bit tedious after 3 days. It is a short walk into the village and good trails and the ski parks are very close. Great food and beer at the Mt Hood Brewery next door. I should mention the extensive renovations ongoing. These will last until September. Building work occurs between 9 am - 9 pm. If you have young children you might find it pretty noisy and want a quieter hotel. Inside you are not affected a lot but the place looks a fright from the outside and the number of contractors is large, affecting parking and access to the hotel. We were blocked in one morning. SB01. Thank you for your review. Consider us an ugly duckling on the outside right now. By the end of the Summer we will be the swan of Government Camp. We stayed here 7/23/2017 and while the location is great the motel was not. NO air conditioning in the rooms. It was 85 in the room. I called the front desk thinking I was overlooking a thermostat or control. No there was indeed no air conditioning. The desk clerk told me there are two tower fans in the room though. I told him there was only one and it was already in the window trying to pull cooler air in. He stated he would get another fan. We are still waiting. At 7:30 AM this morning the room was down to 75. They make it a point to let you know they are remodeling and they won't make any allowances for inconvenience. The remodeling wasn't an issue but no a/c was. Maybe you should state that on your webpage. Spoke with a couple other guests and we weren't alone in being both surprised and disappointed that for the cost of a room here you don't even get air conditioning. I know management and BW don't care but I thought I should leave a review. As info tonight I drove by a BW that was lower priced to stay at a competitor that I knew would have air conditioned rooms. It is still July and having air conditioning is important. Sawdust1957. We will be installing air conditioning in each of our guest rooms as part of our current remodel. We will then become the only hotel on the mountain with a/c in their guest rooms. While under construction may not be the best place to stop. The parking lot is small and with construction vehicles and supplies, not much room and not very safe. They claim noise won't begin until 9am but it was 7:30am when we were there. Most breakfast items empty by 8:30am even though it ended at 9am. Not our best BW experience, and I'm a Rewards member. judithl100. Your business is invaluable to us. We have already spoke with our on-site construction crew. I apologize for any inconvenience this may have caused. I was in the area for a wedding and I was satisfied with the Best Western Mt. Hood Inn. The exterior is being remodeled at the present time but it did not cause any issues during my stay. The staff was friendly and helpful throughout my stay. gseeger50. Thanking for your review. We do host our fair share of wedding guests during the Summer. The area is a beautiful place to have outdoor nuptials. Hope to see you again. We were very disappointed with this hotel. With all the construction and very limited parking plus the rooms were just ok. I think the price they charge is wait to high for what you get. The fitness room is a joke. We had a mini suite. fool4travelin. I am sorry that your stay at our hotel did not meet your expectations. We are a destination location, not an expressway hotel, so our rates do tend to be higher. You review will be taken into consideration by our management team. We just returned from a trip to Oregon. The last half of the trip was spent at the Best Western in Government Camp. The exterior was undergoing a bit of construction, but the interior and services were great. The staff were all very friendly and extremely helpful. The buffet breakfast was great and offered a variety of hot and cold items. The hotel is located right next door to The Brewery, which has delicious food and great beer. It is located right across the street from forest trails and the walk to town is very short. All in all, it was a great stay and can't wait for another visit. 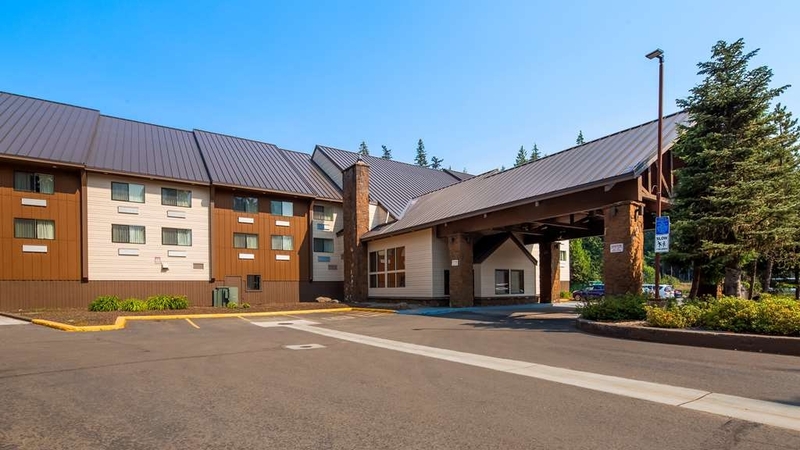 "Summer day on Mt Hood"
Just a business traveler passing through....wanted to enjoy the Mt Hood area, great location, wonderfully helpful staff, nice room, plenty of windows to enjoy the amazing scenery; property offered trail information, local restaurants info., etc. brents383. Thank you for your well-thought out review. We are glad that you enjoyed your stay. Hope to see you again. "Not up to our expectations"
First room we had had crazy really loud noise from the plumbing and water fill and drain from the room above us on the top floor filling, operating and draining their hot tub bath as three rooms had shared plumbing apparently! We could also hear music from the room above too. We asked to move rooms and then got a top floor corner room and no noise. This room had the afternoon sun and the room was hot, however the hotel doesn't have air conditioning, so we closed the curtains and when we came back later to the room opened the window all night and got early road noise. Only one member of staff checking in people when we arrived and this wasn't enough. We had emails in advance to tell us about refurbishment building works during our stay and these didn't impact our stay at all. Car parking was restricted in space due to the building work. Breakfast basic so we skipped it and grabbed some along our journey. RedLees67. I apologize that your stay was less than you expected. Our guest rooms will have air conditioning once our remodel is complete. "Good location, good for price"
We needed a last minute place to stay in Government Camp and were happy that Best Western had a room available. Room was clean and staff were friendly. No A/C so it can be warm in the summer but there is a fan in the room. jeffifereW9123EP. We are definitely a busy hotel in the Summer. Thanks for stopping by. Hope to see you again. "Totally fine for one night"
I stayed here with a friend for one night before we went backpacking. The room was fairly large for two queen beds. The room was clean, although outdated. That may change with the construction they have going on right now. There was no A/C but there was a ceiling fan so that helped to keep things cool. The staff was friendly and the breakfast was average. It's within walking distance to a bar/restaurant that has good food so that is a plus (especially after a long day's drive). Summer G. Thank you for your review. We are happy that you enjoyed your stay. An update for the guest rooms is in the plan, but we may not be able to get to that during this construction season before the snow starts falling. The staff here is so nice and helpful, the rooms clear and comfortable, the breakfast perfect. They have an underground garage to save you from the weather and nearby food. We came in stinky and gross from a long day of travel and hiking, and the young lady at the desk treated us like royalty. I made the reservation on my phone, in the car, as we traveled. It could not have been better. Fine. Nothing spectacular. Good location, comfortable beds, adequate service (nothing worth noting), good breakfasts. Coming back in a week, will stay at Timberline. For the little extra, it's worth it. 5 couples on motorcycles spent the weekend . The only problem which we knew ahead of time is, that they are remodeling the hotel. Putting on a new roof. Other than that it was fine. Rooms were good. There are only two floors. Have a Continental Breakfast in the lobby. Also have have limited covered parking. Hot Tub on site, no swimming pool. David H. Thank you for taking the time to leave a review. Come back and see us again soon. Our stay at the Mt. Hood Best Western was a very positive experience. The check-in staff was very friendly and accommodating. The room was very comfortable and nicely decorated. There was a restaurant and microbrewery a short walk away. MontanaYork. Thank you for taking the time to leave a review about your experience staying with us. We hope to see you again soon. Was very happy with the room . The service was very good and clean everyone was very helpful too . The breakfest was very good too . Parking was good and liked the location of the hotel too we could walk too some near bye sights too . fnoble55. Thank you for the review. We really do have our own piece of perfection here on the mountain. Hope to see you again soon. 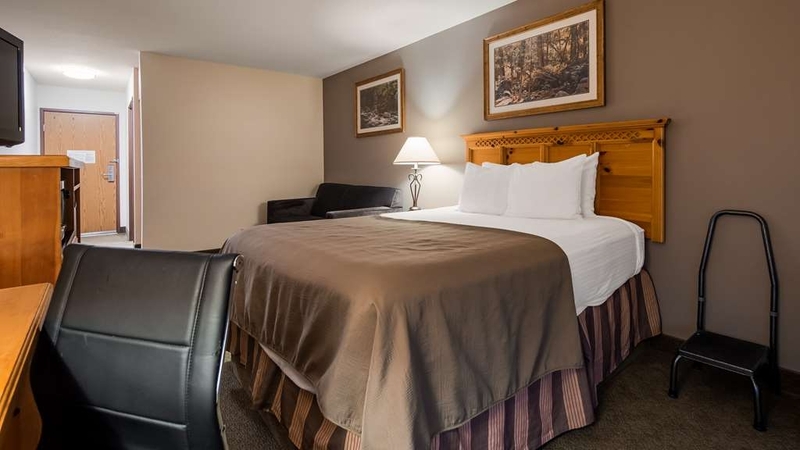 "Really good place to stay"
The Best Western Mt Hood Inn is an excellent option for a stay in the Mt Hood area. 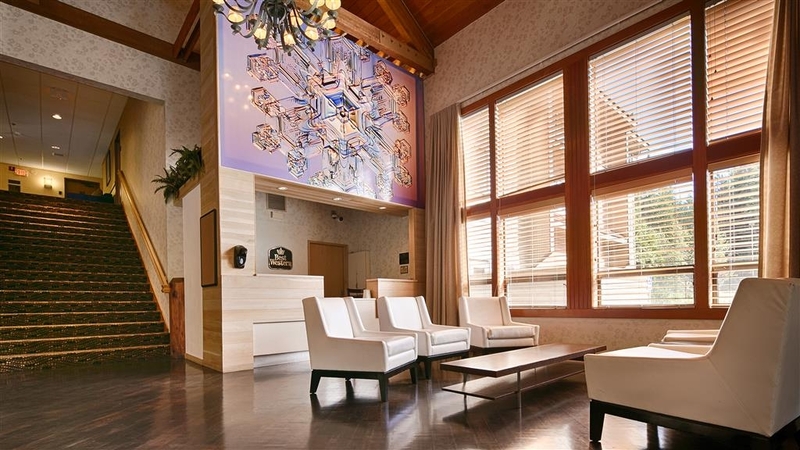 It's a modern hotel located in Government Camp just a 15 min drive from the Timberline Lodge and Ski Area. The room had a nice feel to it and featured a fridge, microwave, Standard Definition TV and free Wi-Fi, but no safe. The complimentary breakfast set you up for the day with a good selection including eggs, bacon, sausage, cereal, bread, pancakes and fruit. The Mt Hood Brewing Co right next door offered good evening dining. Richard J. Thank you for your review of our hotel. We offer the use of our safety deposit boxes located behind the front desk instead of in-room safes. Hope to see you again soon. This is just outside of Timber Lodge ski area. 15 minute drive up the mountain to go skiing. The hotel is in a cool little town with nice shops and restaurants. Hotel is clean, resort type of hotel. Premium breakfast with Bacon and salsa. Rooms are clean and comfortable. Service is great. Mikeleemon. Thank you for your review. We are glad that you enjoyed your stay with us. Hope to see you again. "very good in many ways"
run4fun2. Thank you for leaving a review of our hotel. The weather is beautiful this time of year. There are many trails that are easily accessible in this area. Hope to see you again soon. $140 per night is pretty good. Most of the staff were incredibly nice, the only exception was a gent who seemed a bit rude when I asked about the roll-away bed I'd requested. I spoke to a rep and was told it would be no problem. The staff person told me "we don't have roll-aways" and when I said the reservation person had told me no problem he stated "well we don't guarantee them" I was a bit frustrated by that, if you don't have them then don't tell me you can't guarantee them just tell me you don't have them. Anyway, the place was very clean, the lobby always had coffee, tea, etc. 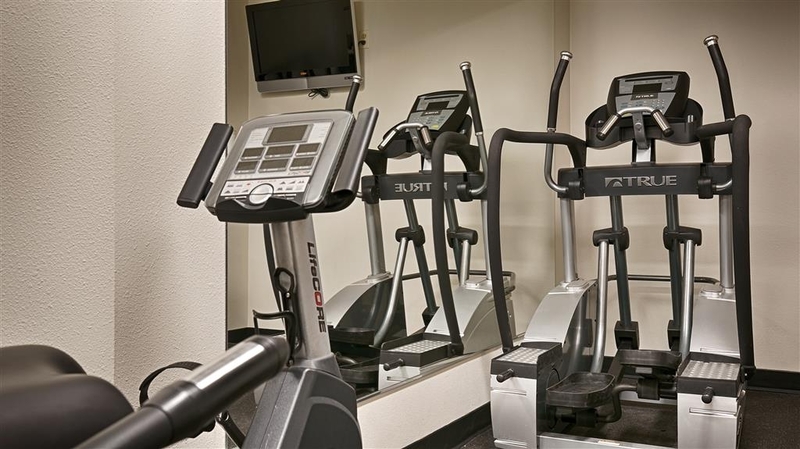 There is a small fitness center and computer/printer in the lobby. The rooms have basic cable but IMPORTANT NOTE none of the rooms have AC! I like my room cold and also like the noise cancellation of the AC. This is not currently an option but they noted they are "working on it". Dave d. Thank you for taking the time to review your stay. I apologize about the confusion regarding the availability of roll-away beds. You requested one when you booked, but we do not offer them at this hotel. There is a disclaimer that not all requests are guaranteed. The reservation person you spoke to works from a centralized location for Best Western, not for our property. As for the AC, we do have central air in the halls and lobby areas. This Summer, we are installing units in each of our guest rooms. It is part of a larger project that did require some extensive planning. room was great, clean, quiet, comfortable and the balcony was magnificent, scenery was beautiful, landscape and Columbia River were so clean, don't think I've ever stayed at Hotel that had everything, staff was wonderful, so glad I had the opportunity to enjoy the food at the Restaurant the Halibut was cooked just right, also enjoyed the trail from Best Western to Downtown Hood River. which was also so much fun to stroll in such a beautiful town, if anyone is traveling near Hood River Your Stay Best Western will be well worth the visit, thanks for such a fun stay. Cleve A. We do love visiting neighboring Hood River. Our location is located approximately 45 minutes West of the town. This review was most likely intended for the Best Western in Hood River, not Government Camp. When we got to the hotel, we were welcomed right away with a nice gift. The room was very spacious & nicely set up. We initially had a problem with the heating system, but that was rectified right away. The wifi worked well & the breakfast was excellent on our way to check out. Z8079BZalbertob. Thank you for taking the time to review your stay. We hope to see you again soon. This hotel was superior to many in the same price range. The staff were very helpful and professional. The room was large, well equipped, and very clean. I would stay here again without question -excellent experience. 817adeleb. Thank you for the review. Hope to see you again soon. "Very good and a good location." If you want to be near Mt. Hood and have nice lodging this is a good choice. An inclusive full breakfast with fruit, protein, grains, juices and coffee. Comfortable room, good internet, friendly staff. Some ski lockers, and a parking garage.Close to everything (Government Camp is small) and very close to two ski areas, when it is a good snow year. We will be back. waterboy1368. Thank you for taking the time to review our hotel. We have two seasons here, snow and hiking. Maybe you'll come see us for the other as well. Beautiful facility. Spacious room. Quiet. Most comfortable bed. Very friendly staff. The best complimentary breakfast including eggs, meat, waffle maker, fruit, etc. Microbrewery restaurant right next door. Free outdoor or indoor parking, which is nice in a rainy/ snowy climate. * Everything was great, except the Wi-Fi, in our room 141 at the end of the hall, kept dropping the internet and restarting, so often that I could not even check email on my laptop. I didn't check Wi-Fi in other parts of the building, Not a problem this trip, I just used my cellphone. Kayaker611. Thank you for the update on Trip advisor. Your experience at our hotel is very important to us. "Excellent value in Government Camp"
We stayed here for a weekend snowboard trip to Mt. Hood. Our room was spacious and clean. The hot tub soak helped soothe my aching muscles (but don't expect anything fancy. This tub is all about function over form). Breakfast is included in the room charge, and it was nice to pig out on pancakes, bacon, and sausage. The coffee was good (that's all that really matters, right?). Free wifi in the rooms kept us connected which made up for the sketchy cable tv. Overall, this is a great way to save some $$$ for the rest of your Mt. Hood adventures. Vanillawafer. Thank you for your review. Our tv is provided through a popular satellite company, but as we are in the middle of a national forest, sometimes our service is not perfect. That same national forest makes up for it with all of the outdoor activities. "Would definitely go back there"
Good location, great price, very good breakfast. Someone wrote about noise; I could see how with the way it is constructed it might be an issue, but there were not many guests when I was there and this was not an issue for us at all. Easy drive up to Timberline, but if you want, you can take the shuttle instead. CharlieFromTampa. Thank you for the review. Hope to see you again. Really liked this hotel. Our two queen bed room was large and set up well. The beds are taller than most hotel beds. They have a full self serve breakfast with meat items and a pancake maker machine!! We will be back. "Best deal on the mountain"
Loved this place!! Friendly and welcoming staff, comfortable and clean rooms, and a decent breakfast, plus easy walking distance to the oh-so-funky pubs and restaurants of Government Camp. 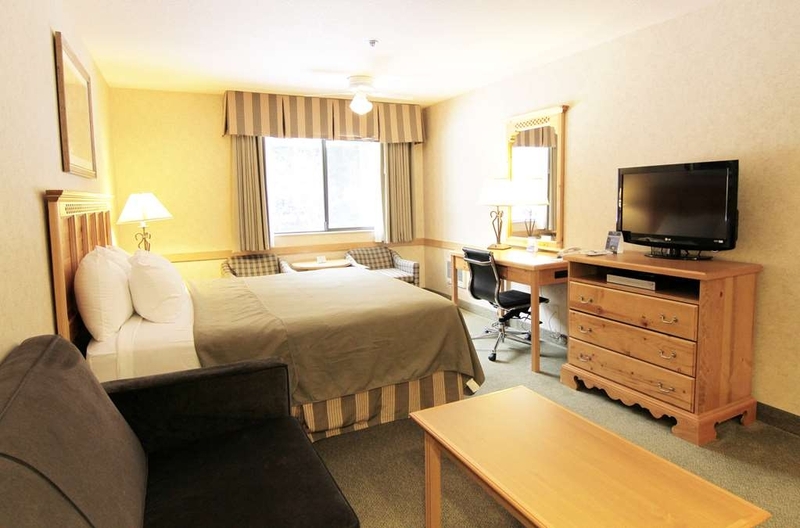 All this for a very affordable rate - and just a 10 min drive to Timberline for great skiing!! Just can't ask for anything more. Oh, and the covered parking and ski lockers were both appreciated. Nice location. Unfortunately, rooms on the 100 level are completely unsatisfactory for rest or sleep due to the noise from rooms on the 200+ level. A toilet flush, shower, or lav used from the top floor are clearly audible as well as anyone walking (or shifting furniture-it was hard to know the difference) and occasionally talking came through the ceiling. We will not book again. Bill H I apologize that your stay did not meet your expectations. We don't get very many noise complaints, but we do take them seriously. Did you speak to the front desk about it? It would have been our pleasure to resolve the issue. Thank you for your review. Accommodated my request even on a busy weekend, the bed was very comfy. We did not use the Jacuzzi or fitness room. Our short stay was better than average of other Portland area Best Westerns. The ceiling light/fan did not work, water pressure changed a lot during my shower, but room appeared clean and heat worked, which is all I need. Very short drive to Mt Hood, can walk to shops and restaurants. Overall I recommend. Overall a nice hotel which was clean and had comfy beds. Heater kept breaking and needed to be reset. The breakfast was great and had many options for all of us. Staff tried their best to be helpful and courteous. The staff were attentive and responsive. I was with my two sons for spring break. The location to the slopes is good. I would recommend staying at BW. Breakfast was fresh and the hot food was hot. Checkout was easy and the room had internet service. Extremely loud and inconsiderate patrons throughout the hotel. Front desk admitted to thin walls and was initially discourteous, but were eventually receptive and accommodating. We have young kids and are probably overly considerate and expect too much, but our kids are quiet while in a hotel (we work shift work - Firefighter and RN - and occasionally sleep during the day). I will never stay here again and will be canceling our second night. Beds are actually decent and rooms are clean, but there is no fan/AC and it's currently after 11pm and people have been shouting in the hallways slamming their doors all evening. "Felt like the perfect getaway"
Though I've passed this hotel many times on my Oregon travels I had never stopped in this area. Finally stayed here and I was really on vacation. Loved the comfortable room and found it to be very quiet. There was even a baby staying in the room next door and though I think the parents were extremely considerate, barely heard a thing all night. The breakfast was consistent to what I've found in other Best Western properties. There's also a restaurant right next door for dinner so that was a bonus. Would love to do a winter stay. Such a beautiful area and this hotel is really in the perfect spot. "Nice Room; breakfast could use an upgrade"
Our room was very nice and spacious. The hotel seems well maintained. Our only quibble was that the free breakfast could use an upgrade, such as having real scrambled eggs rather than the thawed out egg hockey pucks they put out. AndoverDan. Thank you for taking the time to review our property. I want to apologize about the "egg pucks". We were not amused when our food services company delivered the wrong product. We normally offer scrambled eggs and rotate the meat choices. Hopefully, this error does not keep you from coming back. "Great room but a little noisy from road"
This hotel was just about everything we needed for the night, however, there was a lot of road noise despite the fact that it was back off the main road. It did not have a restaurant but there was an excellent restaurant right next door (Mt. Hood Brewery). Sandra P Thank you for taking the time to review our hotel. We also think it's wonderful that we have such a great restaurant located next door. Hope to see you again! Good hotel. Seemed to be well maintained. Nice mountain location.Above average breakfast. No ac in rooms though. Some covered parking, although tight to get into. Night staff wasn't overly inspired or professional looking. Better in the morning. Price was ok, but not much competition. Richard H. Thank you for choosing to stay with us during your family vacation. We pride ourselves in making our guests' stay as comfortable as possible. Hope to see you again! The highly recommended hotel was full so picked this as a second choice. A little worn but overall not the worst choice. Staff friendly and location very good for getting to the mountain as well as a good stop off for a trip down the Columbia River Gorge! MCB11. Thank you for staying with us and taking the time to leave your review. "Best - Best Western I've Stayed In"
From check-in to check-out the staff was extremely friendly and helpful. The hotel exterior and interior was perfect for the Mt. Hood environment. There is Mt. Hood Brew Pub next door which offers a cozy atmosphere, good food and excellent beer. This hotel and location is excellent! George L. Thank you for taking the time to review our hotel. We are happy that you enjoyed your stay with us. Hope to see you again! This Best Western was convenient as we were traveling through the area. The rooms were great as well as the service. They didn't serve breakfast but you could go right next door and order from a select menu free of charge. I didn't actually stay here, but I booked it via TripAdvisor with the "pet-friendly" box checked, so never thought to call to verify. I pulled in very late only to have the woman at the desk tell me "no dogs." I explained my predicament and she sympathized but couldn't help. I had to drive 10 miles down the mountain to Welches to find another place on short notice. "Nothing special; book early in town for a more enjoyable experience"
Though there are several lodges and motels and cabins in and around Mt. Hood / Government Camp, the ratings for Best Western are NOT warranted as the best. It's an average BW with predictable reception coldness, distance parking, simple amenities. It will do, but the rooms have no charm. Management overdoes it on the carpet refresher ! Smells like an ad for Carpet Fresh ! TVs are a bit outdates and should be modernized. Very basic, very uninspiring and very predictable. Not for anyone looking for a 'charming' ormunique experience to complement a trip to majestiec Mt. Hood. dinner8. Your review is important to us. We will take your suggestions into account when we plan our remodel in the next few years. Thank you for staying with us. Stay away if you have asthma or are bothered by smells. Also, the staff is very unhelpful as they cannot do anything without contacting their elusive boss. The rugs had threads coming up and it smelled of a mixture of dog pee, old water and carpet fresh. 463mmia. We are aware of the issue that arose when you checked-in to your room. Again, we apologize for the inconvenience it had caused you. Your complaint was something we have never encountered, so it caught our staff off-guard. Your room's carpet had recently been shampooed. We do not use carpet deodorizer and we have a strict "no pet" policy. Since you checked-out as soon as you checked-in, we gladly refunded your stay. As always, we will do our best to accommodate special-needs requests, like allergies, when given notice. The hotel seemed to be a very accommodating place, until I had gotten to my room. When I arrived, it was sweltering hot, and the air conditioning thermostat was nowhere to be found. So I called the front desk and they said that the hotel does not provide air conditioning. I said that is fine, can I have a fan in my room, and they said no. While the complementary breakfast and free WiFi are a nice thing to have in a hotel, cleanliness and proper temperature at which to sleep, especially in the summer, are important. One out of the two of the quintessential elements that must be provided were not, and therefore I had to give this hotel 2 stars. Juerys F. Thank you for taking the time to review our hotel. I apologize that your stay was less than satisfactory. Without going into great detail, we are aware of the temperature increases that this area is recently experiencing during a few weeks at the end of Summer. We do have a ceiling fan in each room, as well as quite a few tower fans that can be brought to the room by the front desk attendant. We also provide complimentary cold bottled-water. We want our guest's stay to be as comfortable as possible. 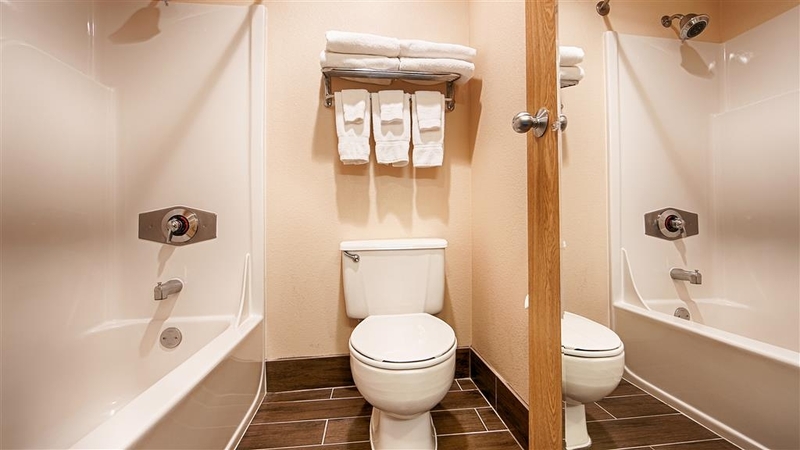 "Good option near Mt Hood"
It's a Best Western and as such has all the expected amenities It is close to Mt Hood.The major downside is that it is very close to a major state highway with truck traffic all night long. Bring earplugs if you are sensitive to noise. And it's not clear to me why a hotel in the mountains would have relatively skimpy bed covers/blankets. The heat in our room worked fine, but we like to sleep in cooler temperatures under several blankets or a comforter. Unless you want to crank up the heat here, bring some warm pajamas. Donald G. Thank you for taking the time to review our property. We do bring extra blankets to the room, upon request. See you again soon! Very helpful staff. Wasn't able to check in early because room wasn't clean. They let us use the employee room to get ready for the wedding and leave our bags until after the reception. There was a nice jaccuzzi tub in the room, but we didn't have time to use it due to the reception and after party. 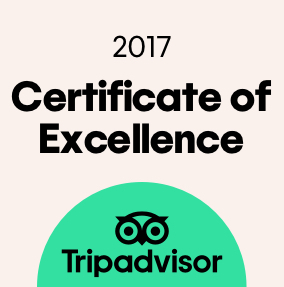 972meghanj Thank you for submitting your review through TripAdvisor. I am glad that we were able to accommodate your needs before you headed to the wedding. Best wishes to the new bride and groom. 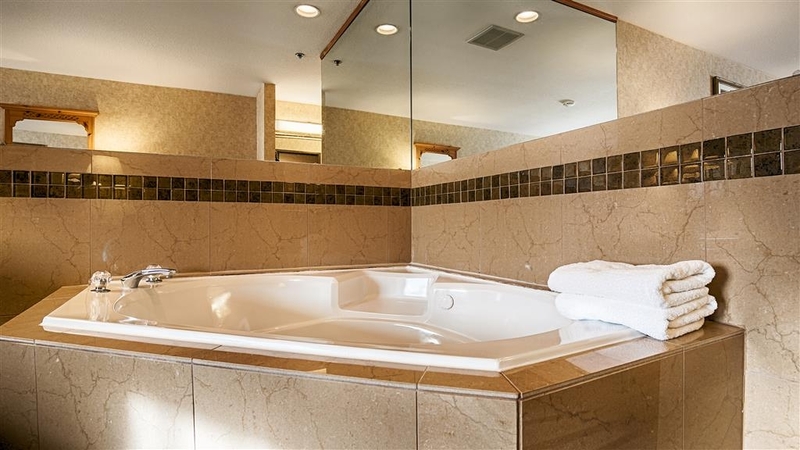 As for your lack of Jacuzzi-time, perhaps one of our King-suites will be available next time you're in town. See you then! "Excellent location for Mt Hood visit"
Located in quaint alpine like town of Government Camp very close to road leading to Timberline Lodge and ski facility. Large well appointed rooms with elevator access. Breakfast average, staff welcoming and helpful. Lack of air conditioning not a problem for our September visit but must be during summer. They take pains to inform you in advance and advise that they are addressing the problem. Not sure I buy their excuse that it wasn't needed until global warming came along. Stu86. I wouldn't necessarily use the term "global warming" when referring to the fluctuations from our normal temperatures here. Sometimes it's cooler than normal, other times it's warmer. There are only a couple of weeks, total, during the late Summer when the temperatures get uncomfortable. In the last couple of years, we have installed central air in the lobby, and most recently, in the halls. We are still working on getting individual units for each room, but with construction constraints, it is taking longer than we had hoped. Thank you for your understanding and taking the time to review our hotel. ...for the exceptional service and atmosphere. Safe, comfortable and reasonable. All went out of their way to serve. They even had an automatic pancake maker for those who don't like waffles. :) I look forward to returning and exploring the area. Donald Edward S. You are very welcome! And thank you for taking the time to review your stay. 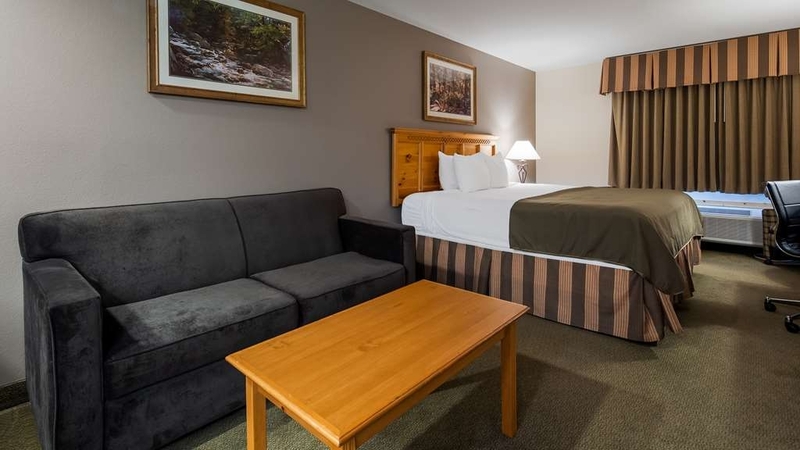 This week, we are offering a special rate through our Facebook page Best Western Mt. Hood Inn. You may want to check that out. See you soon. Loved it here. Close to everything. Great price. No problems at all. We had a great, spontaneous weekend. Hood River is just 40 miles, nice for a little day trip. Great views of Mt. Hood from Trillium Lake and Mirror Lake. Just a couple miles away from the hotel. Kelly S. Thank you for taking the time to post your review on TripAdvisor. We are glad that you enjoyed staying with us. "Reasonable Property near Mt. Hood"
Stayed there for one night. Property does not have AC but this time of year, keeping window open and let ceiling fan run was enough. It seems that it could use a little face lift and room has slightly stale odor. It is close to shopping area and to Mt. Hood and other areas of interest. Free breakfast and internet are good. Noise coming from floor above was troublesome and had to ask front desk for help. Overall OK property. BMRajpura. Thank you for taking the time to review our hotel. We appreciate the feedback. "A bit of history and another time"
I love to stay at the Mt. Hood Lodge. I climbed the mountain starting from there at one time. It is a bit dated as it was built in the depression days as a works project. The magnificient fireplace and the use of woods throughout add a charm and special feeling. It can be a bit drafty when it is really cold. The hotel was on par with Motel 6. Attractive pictures on web site but interior was old and tired. Beds and pillows however were quite good. Room carpets were stained and heating poor. Facility was generally a cheap "knock off". TomdY501GL. I apologize that your stay with us did not meet your expectations. We appreciate you taking the time to share your experience with us. The Mt Hood Inn is in a lovely location on the edge of Government camp. Such a shame we couldn't see Mt Hood because of the weather. The Inn made up for the cold wet day outside. Our room was very spacious with 2 queen beds. I had asked for a quiet room & was rewarded with one well away from the highway with a nice view of the surrounding woods so road noise was not an issue. The beds were comfy with plenty of pillows. An extra blanket in the room may have been nice. The complementary breakfast was enjoyable with enough selection for you to have as much or as little as required. All of the staff we spoke to were very helpful & friendly. A great place to stay. francophile5310. We appreciate you taking the time to review your stay with us. The peak of Mt Hood does like to play hide-and-seek during seasonal weather changes. Regardless of that, we are happy that you enjoyed this piece of the Mt Hood National Forest that encompasses our property. For future reference, one of our service professionals will bring extra blankets to the room upon request. Hope to see you again. This hotel was extremely clean with friendly staff. It is at an excellent location to enjoy the multitude of beautiful trails in the area. This Best Western had a lovely lodge decor. Breakfast was the usual fare, but hot and well presented. LOis003-02. Thank you for taking the time to review your stay with us. The Mt Hood area is a beautiful place to visit year-round. We'd love to have you back. The rooms are very large and nicely furnished. The cleaning staff is excellent . The breakfast person kept the breakfast area spotlessly clean and was very nice. The front desk had two very friendly young men working. The road noise could be a problem. The price is reasonable. The location is excellent for visiting the lodge. Kapcat Thank you for taking the time to review our hotel. We are glad that you enjoyed your stay here. We hope that you come back again soon. "Good location for Mt. 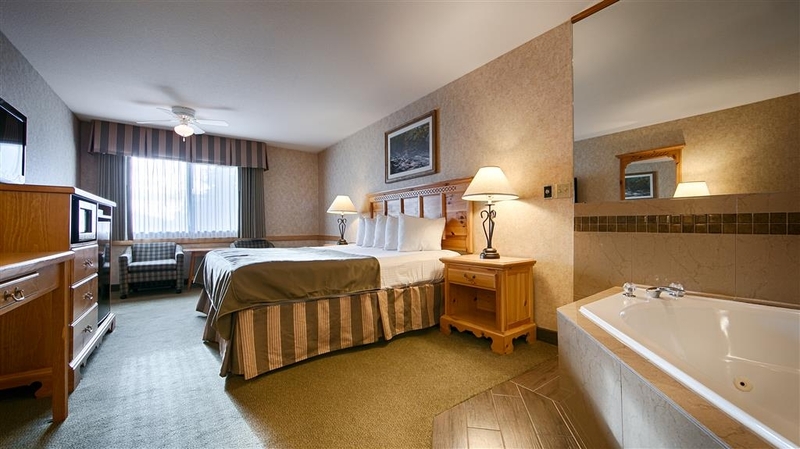 Hood fun"
At the foot of Mount Hood, this is a great place to get a room at a decent price. The rooms are nice and the place is quiet. My only issue was when I went to check out, they said I had booked for 3 days, when I think I only booked for 2. It was 8am when we were checking out and they threatened to charge me for a third day because I didn't give 24 hour notice of leaving. I tried to explain I didn't book 3 days as my plane was leaving that afternoon, but the desk attendant said it would be up to the manager to decide if I would be charged additional. Luckily they never added the additional charges, but never have I had an issue checking out early if I needed to. And the fact they even brought it up at 8am bugged me. The housecleaning crew hadn't even arrived yet! Don R. Thank you for staying with us. We appreciate your feedback. 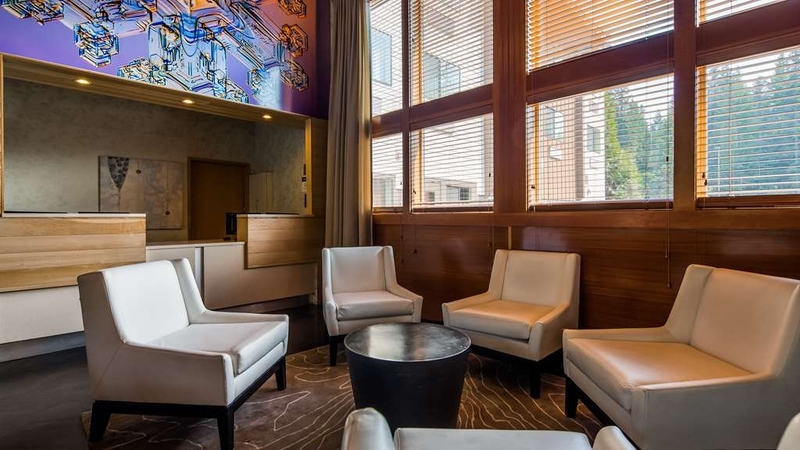 "Nice place to stay after a day as Ski Bowl Adventure"
Tim K. Thank you for taking the time to review our hotel. We are located in the scenic Mt Hood area, with a climate that allows its visitors to spend the majority of their time outdoors year-round. Many of our guest come here to ski during the winter and hike in the summer. Thank you for staying with us. I love to do road trips mixed with photography...taking in our beautiful country, seeing what's around the next bend in the road. When I schedule these, I often plan my route around the availability of Best Westerns. There are several brands out there, also of good quality - but the Best Western experience - to me - feels like coming home. You're part of the family, and cared for. I recently stayed at the Best Western Mt. Hood Inn, and they did not disappoint. From check-in to check out, the staff was kind and helpful, the accommodations clean and comfortable, a nice hot complimentary breakfast... Just a relaxing experience in a beautiful location. I would definitely stay here again. Elizabeth D. Thank you for taking the time to share your experience at our hotel. As a destination hotel, many of our guests have come to take advantage of the beautiful scenery of the area. We are happy that you enjoyed your stay and hope to see you again soon. Jeff the general manager is very rude and not helpful, even though all employees referred me to him. In fact, he choose to hang up on me even though I did not curse or raise my voice. This effectively ruined/ canceled my vacation. He claimed I threatened him when I told he that I would be writing this review. If it's taken down I will rewrite it as many times as necessary. Brenna0621 It is unfortunate that you are still continuing to give this hotel bad reviews. You have not stayed here. You booked a non-cancelable/non-changeable room through Priceline for the wrong date. We instructed you to contact them about your reservation because your contract was with them, not us. You could not get an immediate response from them, so you called our hotel back and demanded that we fix your error immediately. Because we could not, you threatened that you would be "forced to write bad reviews'. (Quoting what you told Best Western customer care.) A few hours later, Priceline finally responded and cancelled your reservation. Perhaps, instead of writing these unnecessary reviews, you should be taking some time to relax. First things first, the room was very reasonably priced! For the price I was very satisfied. I made my reservation over the phone and the representative was VERY up front about the lack of air conditioning. They gently reminded about the cancellation policy and to check the weather. We did and it was hot. We opened the windows and ran the fans during the evening. However, you do not want to do this during the night as the highway is crazy loud. The outside temperature will drop quickly in the evening. I think if you are aware of this and able to get the air flow going early in the evening you will be fine. We were. The hotel is very charming and looks like it would be wonderful with people coming to Mt. Hood to ski. It has great access to Ski Bowl, Timberline, and even Meadows. In the summer there is great access to hiking and the ski bowl adventure park. Government Camp is so charming with several great places to eat. The rooms have everything you could need. The beds were fine but the pillows were awful. I don't even think I've ever commented on a pillow in my life but they were terrible. The breakfast had a lot to offer but there were a few things that were either expired or not stored properly. Madmanswife :) Thank you for taking the time to review your stay. I have been made aware of the breakfast issue that you mentioned. The problem was found and resolved. I apologize for any inconvenience this has caused you. We take pride in the free breakfast that we offer and want our guests to enjoy it, too. As for the pillows, we place four on each bed for our guests to adjust to meet their comfort. (I don't think I've ever received a pillow complaint until now) As for the beds, the mattresses are new. We're glad that you liked them. Come back soon. "Great Location for Mount Hood"
I stayed here one night and at Timberline for 2 nights. If I had known I would have stayed here the whole time. 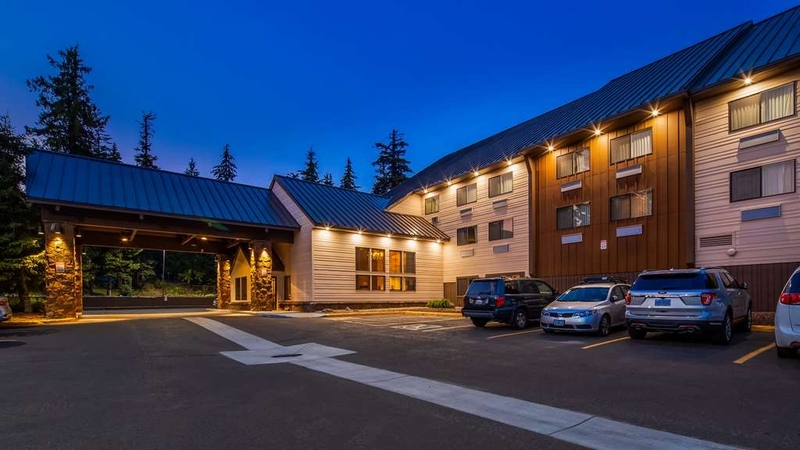 Clean, quiet, and convenient- right off the highway and 10 minutes from Timberline. The free breakfast is convenient too. Mark O. Thank you for your review. We appreciate you taking the time to let us know how we are doing. We pride ourselves in making our guests comfortable during their stay. Hope to see you again soon. "Good Hotel in quiet location"
Good hotel & we had a nice big room. Sauna was good to. Breakfast was fine, with a pancake maker, cereal, yoghurt, muffins, bagels, sausage links & eggs! Government Camp is not very big & you're very limited to where to eat, with it being about a mile (but easily walkable in the light). The mount hood brewery is next door though and we had 2 good meals there and a nice selection of beers to choose from. Mount Hood is really nearby, so its not a chore to get there and to the surrounding lakes/walks etc. I would recommend this hotel if you are staying in the area. Jason T. Thank you for taking the time to review our hotel. We are happy that you enjoyed staying with us and hope you come back to visit the area again soon. "No Airconditioning in 90 degree heat"
Stay away from this hotel at least during the summer because they have no AC and with the increase in heat during the summer months it is inexcusable to have AC in the lobby only. It was difficult to sleep and fans did not do much to help as it did not cool down very much in the night. Check in desk clerk was totally bothered by us being there and showed absolutely no interest in us during check in. Will never stay at a BW again. Phillip S. We apologize that your stay with us was not satisfactory. We do our best to accommodate our guests during these unseasonably-warm days. Thank you for taking the time to fill out this survey. The room was not insulated from noises, couldn't sleep, heard everything. The bed was uncomfortable, pillows were bad, front desk clerk at check in was rude. Elevator barely held the luggage cart, not staying there again. Hello Richard. We apologize that your stay with us did not meet your needs. We welcome you back again with the hopes that we can improve your view of our facility. Until then, thank you for your review. My wife was hiking the PCT and came off for a day in Government Camp and ended up getting a room here. I have been to several Best Western's in my life, as well as the other ubiquitous American chain hotels, and this one definitely stood out. All the usual amenities, but everything seemed cleaner. They have a spa and sauna for when you come off the mountain, fridges in the rooms, clean towels (you might take this as a given, but if you've been to some of these places elsewhere you'll know what I'm saying) and bedding, memory foam beds, coffee maker, tea, etc. The thing I liked the best was the breakfast. I'm used to cold continental or maybe hot oatmeal or something, but this place has a toaster with all types of bread, bacon, eggs, sausage, and a pancake machine, if you're into pancakes. Juices, milks, yogurt, as per usual, but it's all set up to make a rockin' breakfast sammy before you hit the slopes, or the trails, or whatever. If you go in the summer you're likely to see some future Olympians as Palmer glacier on Mt. Hood is one of the only places within thousands of miles with year round skiing. Hello Tiel. Thank you for staying with us. We are quite proud of our breakfast as well. We are glad that you enjoyed it. We want only the best for our guests. Thank you for the review! "Arrived for a wedding on saturday"
I had made a reservation and knew we would be tight to get checked in and get to the wedding. They were great. I called and asked for an early check-in and they went above and beyond to make it happen. We checked in one hour early, were able to unpack and change and get to the event all without rushing. The staff at the desk went the extra mile and even saved 2 cookies for us to have as an evening snack when we returned. I will stay here again! Dear Mary R, Thank you for the kind review. I am so happy we were able to accommodate your request. I am the one who saved you the cookies after your wedding. I hope you choose us again in the future. Fantastic hotel near hiking and skiing. The hot tub in the room is a worth while luxury after a long day hiking in the woods or up the volcano. 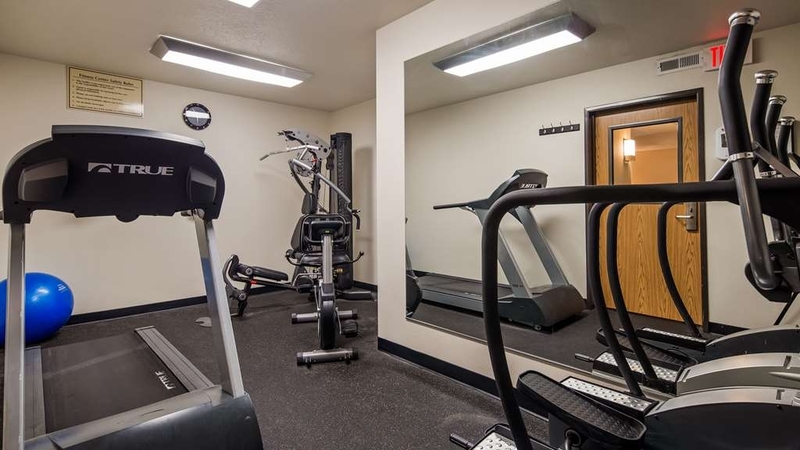 This hotel in the Mt Hood area is centrally located and allows for a variety of daily outings. Dear scandinavian20, Thank you for the great review. I am glad you had a nice stay here and enjoyed the location. I hope to see you in the future. We normally don't stay at Best Westerns so didn't expect much. We were very surprised by this hotel. Room was very good size and very clean. Excellent common area in the lobby with great WIFI and adequate breakfast. Very welcoming staff. This is not a 5 star property but perfect for moderately priced hotel. Dear jack_b1, Thank you for the nice review. I am pleased you enjoyed your stay here with us a the best western. We pride ourselves in having a friendly staff. I hope you choose us again in the future. The hotel website says so and I missed it... there is no air conditioning in the room. Only in the lobby... As the information sheet given at the front desk says, 'the climate is changing faster than we can adapt in our area.' But they are apparently working on it... For now, you can arrive at night, when it is much fresher. Or hang out in the lobby until you don't have to sweat on your bed. Or you can come back in the Fall... Or in the winter. Until then, 175 dollars for a sauna is silly. I can go the YMCA for much cheaper. Dear Olivier p, Thank you for the review. I am sorry to hear it was too warm for you up here. With the elevation of 3900 feet it generally isn't a problem. Great location for base camp while vacationing, hiking, exploring and being amazed by the area. Comfortable, clean, helpful staff and really good free, self service breakfast...not just bread, and Danishes but eggs, bacon, sausage, hot cakes, fruit, yogurt, oatmeal, and more. The beds were amazingly comfy and the stroll to the little brewery next door nice. Loved this place convenient to Mt Hood, hikes, adventure park and more. Dear gibabutcher55, Thank you for the great review. I am happy to hear you enjoyed our hot full breakfast and the staff here. We are centrally located here on Mt Hood with plenty of activities to do all year long. I hope you come back and stay with us in the future! Dear Mark K, Thank you for the nice review. I am pleased to hear the staff was great and you enjoyed the lodge. Hope you come back and stay again in the future. 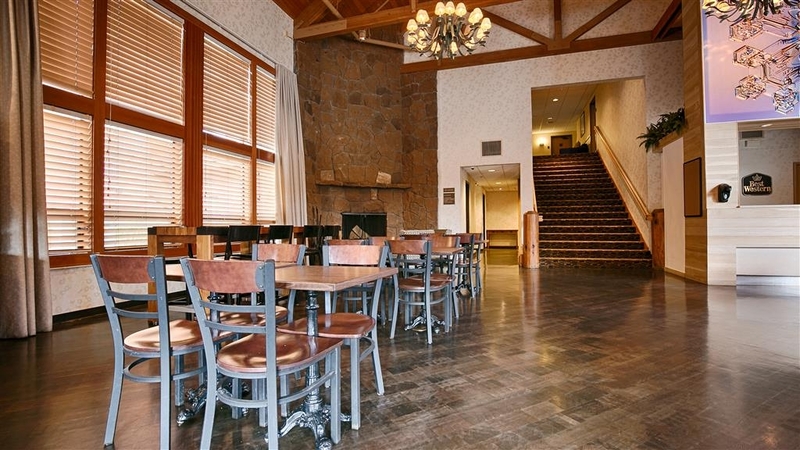 I was attending an event at Timberline Lodge (about 8 miles away) and wanted to stay a couple of nights nearby. The room was clean and comfortable. My ceiling fan had an issue, and within 30 minutes of mentioning it to Zoe at the front desk, it was fixed - she was awesome! TV reception is limited. My room didn't have a deck; don't know if other rooms do. There's limited garage parking on a first-come basis. I've ranked "Service" and "Rooms" as Average because of the TV and no deck; if the Service category relates to staff, it'd be Excellent. Yes, I'd stay there again. Dear Phyllis K, Thank you for the nice review. I am happy Zoe was able to fix your ceiling fan and provide you excellent service. Not a bad hotel. The suite king room is big, comfy bed, micro and fridge. All is good. Provides a typical hotel breakfast. Just know that it is along hwy 26 with lots of traffic noise. There is a decent Brewery & restaurant right next door. Convenient if you arrive late. Also very close to Mt. Hood so you can go back there. But the price was very reasonable. Dear Crackerjack1954, Thank you for the review. I am happy to hear you liked your sing suite and enjoyed the brewery next door. I hope you choose us again in the future. "great spot with some problems"
Cute lace with welcoming lobby and evening snacks. Well suited room for the level of hotel. Problems come with things like noise and housekeeping. Great little soaking spa/hot tub. Solid breakfast. I'd stay again if someone would actually clean my room on a couple day stay. Just one of those things kind of off-putting to climb under covers and find gravel in the sheets. Dear eliana23, Thank you for the review. I am sorry you were not happy with the housekeeping. The front desk would've been more than happy for help with that. What generally happens is people forget the do not disturb sign is on the door. We legally can't enter a room if that is up. Beautiful, quiet, peaceful......and there is a brewery right next door......oh and also a MOUNTAIN!!!! and many lakes nearby. Lots of hiking and wildlife, not to mention friendlies.! I would suggest staying here again. "Popular Motel Near Mt. 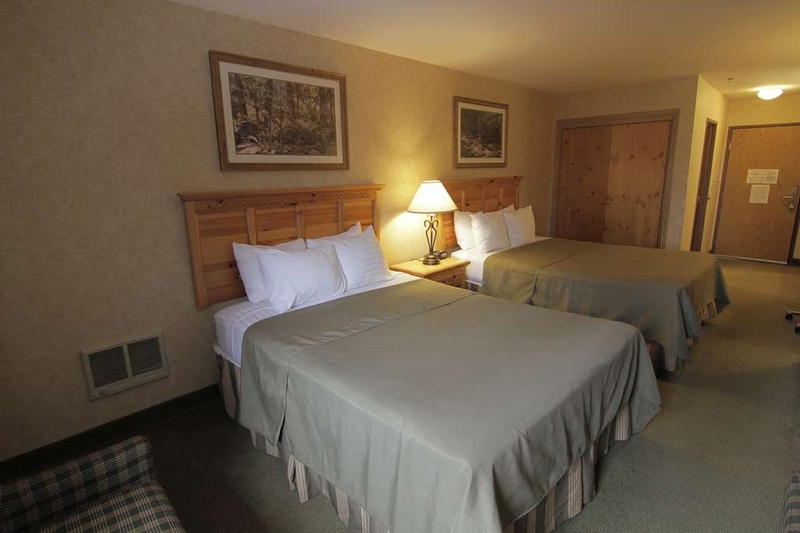 Hood"
The motel is located adjacent to the highway and close to the ski areas on Mt. Hood. Don't even think you can check in before 4:00pm. Staff will curtly remind you of this fact. Apart from the check-in reminder, staff are good. A pleasant enough hotel with odd narrow entries given it's catering to skiers. The lobby is small given the number of rooms and the "free" breakfast which is somewhere between dreadful and slightly better. Rooms are fine although noise is transmitted from adjacent rooms. Just a few feet away is a brewery/restaurant if you don't want to drive for dinner. Absent an important reason to stay here in the future, I'd sleep elsewhere. Dear sagecrest, Thank you for the review. We do our best to get people checked in when the rooms are ready. People need to understand this is a resort location and we sell out most nights. Our loyalty members get first choice of an early check in. The majority of the people who stay here are attending events and all want to check in early. Our housekeeping staff does their best to get the rooms done before our guaranteed check in time that is 4PM. I apologize if it was not convenient for you. "Ski hotel type of lodging but good service"
We arrived late but they still had a room for us. Bit pricey for what you get but spacious room, with two large queen beds. The people at the desk were helpful and friendly both in the evening and the morning. Lights were not abundant in the room (also for shaving) as were power sockets. Shower/bath was okay. Breakfast included with sufficient choices (also fresh ones). I liked their pancake-making machine. This is a ski resort hotel which shows from the interior. They have a spa and a fitness room but we didn't use it. It is just alongside the road which is already busy during the early morning. Dear Ortwin, Thank you for the review. I am pleased to hear you had a nice stay here and enjoyed the staff here. Please choose us again if you're travels lead you back this way. "Perfect location for mt. Hood activities"
We stayed at the hotel one night. Our plan was to climb mount Hood (which we successfully completed) next morning. So, smooth arrival and departure was extremely important to us. In the morning, we had a nice and tasty breakfast at 6AM that filled us enough for a good part of the day. Then, after streamlined checkout rushed to the Mount. "Pretty lodge , but can be noisy"
A very attractive hotel built in the style of a large wooden mountain lodge, with an open airy lobby and helpful staff. Only a small seating area for breakfast in the lobby which caused problems at breakfast with people trying to find somewhere to sit - an average offering on the buffet, but I guess it was 'free'. The rooms are of a good size and comfortable although not cutting edge, the shower room was small, with the sink located in the bedroom. There is NO Air Con!!! With the sun beating on the hotel all day and our room having double aspect windows it was hot, and it was only 70F (21C) outside, I hate to think what the rooms are like when temps really rise. The windows do open, but the noise from trucks travelling along the interstate at high speed is deafening right through the night, as they usually come in singles spaced a few miles apart. Whether the window is closed or open the noise is a serious problem, but may be mitigated for rooms on the other side of the hotel facing the road into Government camp. There is a bar/restaurant located just by the hotel car park for easy eats. The hotel is OK and looks very nice, but try and get a quiet room as insulated as possible from road noise and don't stay here during a hot spell as there will be no relief. "None better in Gov Camp"
Great stay...fantastic staff with special 5 STAR to Cole at the front desk for figuring out how to reboot my PC to get WIFI!!! Yes,no A/C but open your window,turn on the fan and live!!! No complaints, a great place, steps to the brewery and and a few more steps to "downtown" Gov Camp. WIFI is good...TV is good...breakfast is good...You need something else? Great place to base camp from while my son was attending a week long ski camp. Rooms were spacious and clean. Equipment storage was available, guest laundry was big help and the breakfast (eggs, bacon, ham, cereal and bread products) was ready at 6:00am each day which made it perfect to feed the kid before sending him up the mountain each day. Staff was great!! "Great Late night check in"
My kids and I had a late night check in.. Couldn't find Grandma's camp site so I decided to treat us to Best Western. It was dark and late.. It's just nice to see the light on in the Lobby and I could get someone to check me in. The reception located my member card by simply inputting my E-mail address. Although they didn't have a pool, we were nice and cozy in our room w/Wifi and a FREE Breakfast to fill our stomachs back on the road to find Grandma. Dear Wendy D Thank you for the review. I am pleased you enjoyed you're stay here at the hotel. We pride ourselves in friendly and helpful staff. 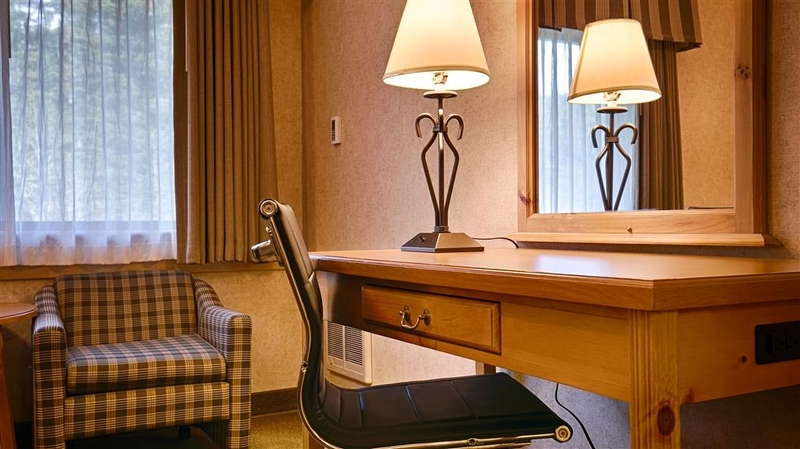 We offer 24 hour front desk so our guest stay is more comfortable. Hope to see you in the future. Generous sized well fitted out rooms. No evening meal service but snacks available from lobby and characterful restaurant/Bar across the carpark. Good centre for exploring the mount Hood area. The reception staff were friendly and helpful well above the call of duty helping me sort out problem with stopped bank card (despite having been paid) Not cheap but prices reflect what you would expect to pay in a popular resort area with very little alternative. Dear Andrew D, Thank you for the review. I am pleased that you enjoyed your stay here at our hotel and found my staff friendly and helpful. We are centrally located with many options in the area. Hope you choose us again in the future. Though there was no AC there was heating. We had a great stay. They had a pre dinner snack witch was tacos. Then they had a great breakfast. Also there was a parking garage. Lastly the rooms where great and updated. Dear MichaelIkon, Thank you for the review. I am glad to hear you enjoyed your stay with us. I hope to see you again in the future. "No frills but VERY convenient location"
Clean enough. Don't even think about checking in early or checking out late. Spa area is minuscule. Breakfast is not worth waking up early for, but breads are fresh and there's a functioning toaster and decent coffee. If you like cooked liquid egg patties you'll be delighted. Staff is friendly but house rules seem to make them seem a bit unaccommodating. No AC, but open window helps - great for listening to light. highway traffic. Clean sheets, hot water, and ample parking. For the price I'd expect some amenities, but there no real competition. Dear Christopher L, Thank you for the review. I am sorry to hear you did not seem to enjoy your stay like the other reviewees. We do try to accommodate special requests for early check in and later check out but when we are sold out it is very hard to do with limited time to turn over the entire hotel. Come back again when it is not sold out and I'm sure you will enjoy your stay! Dear USASOCCER, Thank you for the nice review. I am very pleased you found the staff so friendly. I'm happy you enjoyed your in room spa and our delicious breakfast and taco bar. Please come back and stay with us again! "Wow free breakfast AND dinner"
The hotel has a lodge appeal. When we arrived, the front desk was very helpful. The clerk advised free full breakfast is available as well as a taco bar from 5-6 pm. It was great to be able to eat light and be able to stay in and relax. There is a gravel walking trail along the back. We were astonished at the awesome view of Mt. Hood. There was a trickling stream that made for a very peaceful stroll. We paid $120 (including taxes) and I thought that was very reasonable given the atmosphere, location, and amenities. Dear KathyJx, Thank you for the great review. I am so pleased you got to join us for the taco bar and full breakfast we offer. It is nice that you got to hear the stream from your room. The forest setting is nice and peaceful. I hope in your future travels you will come back and stay with us! "Good location but road noise"
Went in mid June. Noisy as close to main road, but convenient to skiing at Timberline and hikes and lakes nearby. Good place to stop on way to Redmond/Bend. Rooms comfortable. But nothing to do if weather bad or if you do not ski. Dear NazimK50, Thank you for the review. Sorry that you experienced road noise. I am glad you found the room comfortable and hope you will come back again! I have not been at the Best Western chain hotels for some years. My experience many years ago in some city was OK but noisy. Best Western Mt. Hood Inn certainly gave me the pleasant surprise that the overall appearance and environment is clean and well managed. It is at the foot of Mt Hood and is serving the tourists and skiers. The room is clean and comfortable. It has a hearty breakfast which just served our needs. We came in in a day with heat wave but the room is not hot. The hotel provides free shuttle bus to the ski location on Mt Hood. We did not take it since we had the car. Within walking distance next door, one can get a meal from Mt Hood Brewing Company even late at night. From our room window, we can see the mountain top over the tree line. That is an adder. "Clean motel with dinner and breakfast"
This is not a 5 STAR Fancy Hotel, yet it is 5 STAR Clean and Comfortable. Room 205 looks out into the trees, and you can hear the stream. There is no air-conditioning, and you don't need it. Heather, the manager of the hotel was very attentive. My father and I stayed here for four nights while my kids were attending ski camp. The breakfast is billed as a continental breakfast, it is more than a continental breakfast with pancakes, eggs, sausage, bacon, toast, fruit, cereal, yogurt, juice etc. Full breakfast. They also offer a taco bar from 5-6 each evening. My rate was $112.50 during the week and $186 for Friday night. We stayed at this hotel for two nights. It's a good value. The rooms are large, a simpel breakfast is included and a afternoon snack. Good beds, strange bathroom-situation. Unfortunately we did not have good weather, so we did not get to do the things we intended and spent time at the Columbia River Gorge and hood river. Dear Valued Guest, Thank you for the nice review. I'm happy to hear you found our hotel nice and comfortable. Hopefully you can come back and stay when the weather is nicer. Nice stay. The rooms do not have AC so it is not for big babies who can't handle life without AC. Highly recommended, the staff were very nice and the hotel was clean, nice amenities including a small gym and a sauna. Good blackout curtains mostly hide large spotlight in eaves outside 3rd floor window EXCEPT when the curtains must be open to let air from the open window in. Why open? No AC. To get a cool room plan to sleep with the lights on. In winter no worries. Dear Valued Guest, Thank you for the review. We make every effort to ensure that our guest are comfortable and enjoy their stay here. I do apologize for the flood light. I hope you will come back in the future. We booked this location based on its proximity to the areas we wanted to visit while there. This location is a 4-5 star experience at a 3 star price! The staff are amazing, the location is clean and very professionally taken care of. I really can't say enough good things about this location. We will definitely be staying with Best Western again! Dear Valued Guest, Thank you for the great review! I am very pleased you enjoy your stay here and found the staff amazing. We are centrally located here in Government Camp with many things to do here. I hope you will choose us again in the future. "First visit to a Best Western Hotel"
Dear Valued Guest, Thank you for the great review! I am glad you enjoyed your stay here with us. I also value your honesty about the snack and breakfast. We are constantly trying to improve our amenities. I really hope you will come back and stay with us again in the future. It was perfect for our stay! Very clean & accomadating. It was a convenient location for where we were traveling. The room was a nice size with 2 chairs and a refriegerator and microwave. And the resturant across the parking lot has very delicious food! Dear Valued Guest, Thank you for the nice review. I am pleased that you enjoyed your stay and found the rooms nice and comfortable. The fridge and microwave make a nice addition to the room. Come back and stay with us again! I'm a light sleeper so being on the highway, noise from the construction crews working in the area was heard at all hours. Other than that, and a drunk idiot next to our room, the stay was nice...the staff was excellent, friendly and helpful. Breakfast was as expected, good. Dear Valued Guest, Thank you for the review. I do apologize for the road noise. With the construction and road improvements it can be louder than normal. I am glad you enjoyed our full hot breakfast and the staff. We strive on being friendly and helpful here. Hope you will come back and stay with us again. "Surprised with No Air-Conditioning in rooms upon check-in"
We did not book directly with the hotel, but through Expedia. After checking in and being given our room keys, we got a "surprise" sheet of information informing us there is no air-conditioning in the rooms, only the public areas (hotel lobby, etc.) The temperature was around 80 that day in May. The sheet also advised us there were no refunds due to hot rooms. I felt that should have been made clear on booking by the hotel, because it had been a problem for them you could tell, as they explained they were trying to do something about it because of complaints. Dear Value Guest, Thank you for the review. I am sorry to hear you are not satisfied with your stay here. Expedia and all other 3rd party websites do list that this property does not have air conditioning, so there shouldn't have been any surprises. The Mt. Hood Best Western provided the best value I could for my brief, last minute trip to ski Mt. Hood. The location was close to the mountain and the accommodations provided a nice size room, clean, up-to-date furnishing with a TV, microwave and small refrigeration in additional to a complete complimentary breakfast. Dear Valued Guest, Thank you for the nice review. I am pleased that you enjoyed your room and accommodations that we offer. I hope you will choose us again in the future. Dear Valued Guest, Thank you for the great review. I am glad I could help you with your walk and hike. I hope you definitely come back and stay with us again. The staff in Mt Hood couldn't have been friendlier, they made us almost forget a long days drive. Breakfast offerings which included the fixings for a handheld 'mc muffin' type sandwich was a great mountain adventure offering. All in all a great stay! Thanks. Dear Valued Guest, Thank you for the great review. I am so pleased the staff made your long trip better. I like to hear our hot breakfast is great. It is better than your average "continental ones." Hope you choose us again in the future. Don't waste your money staying on the mountain when you can stay here and it's just a few minutes away! 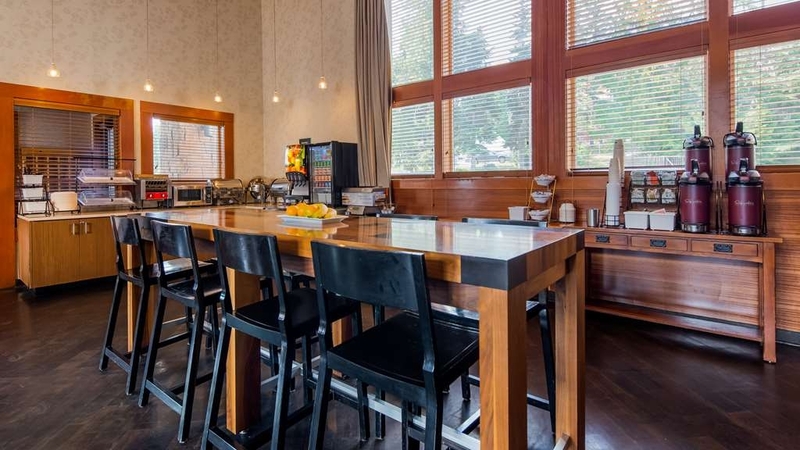 More affordably-priced rooms, free breakfast (they have a pancake machine! ), updated rooms and very friendly staff. Dear Valued Guest, Thank you for the great review. I am so glad you like the hotel and the hot breakfast. I take pride in my front desk staff and I am so pleased you found them friendly. Hope to see you again in the future. Dear Valued Guest, Thank you for the nice review. I apologize for the lack of lighting at night. That is something we are working on. I am happy to hear the front desk agent was accommodating. Hope to see you in the future. "Great place to stay on Mt. Hood-good breakfast-and late afternoon snack-great staff"
We looked forward to staying here again this year for a spring skiing trip where one of us doesn't ski. The double queen room was a nice size with a writing desk & chair, 2 stuffed chairs, an end table, as well as a microwave, refrigerator, and TV. Our room faced the back and we enjoyed the view: snow bank, creek, and yellow lilies.The wi-fi worked very well. The TV had no extra channels, including no PBS. The nice fitness room came in handy for the non-skiier as did the spa room. Last year the hot spa tub was being remodeled, and it was nice to use it this year. Breakfast was very good-lots of choices. The staff was always very gracious and helpful. Our room was clean and very comfortable. We didn't take advantage of the chicken or the chili that was available from 5 to 6 each night because we wanted a full meal, but it is such a nice touch! We did, however, have some of the cookies put out each night! We enjoyed eating at the Mt. Hood Brewing Co. next door. We will definitely return here again! Dear Valued Guest, Thank you for the nice review. Glad you found our room amenities nice and comfortable. We look forward to seeing you again in the future. "Great Value and comfort !!" I stayed in the Jacuzzi room and it was extremely comfortable, clean, friendly staff. Very good variety for breakfast and snack in evening included in the rate. Will definitely return and recommend as close to all ski resorts. Great location for an overnight ski trip! The room was comfortable and clean. We enjoyed the hot tub and breakfast. Nevertheless, at night, the nearby road was noisy at times. Overall, we enjoyed the stay and it was reasonably priced on a Sunday night! Dear Valued Guest, Thank you for the review. I am glad you enjoyed your stay here. I am sorry you were on the side by the highway. In the future feel free to call ahead and request a room on the opposite side of highway. I look forward to seeing you in the future. "Nice but hot without A/C"
We stayed here for one night for a quick trip to Ski Bowl. Room was clean but hot. We were not informed when booking that the rooms do not have air condition. I spoke with someone the day of check in and was informed that we could check in an hour early. When we went to check in the manager told us we couldn't check in early unless we paid $25 for an hour early check in or unless we were a member of their reward program. The guy checking us in told her that he told me he could get us in an hour early and she simply turned around and walked into the back. Basically hung the poor guy out to dry. According to her he was new and didn't know any better. Little did she know, we were members of their reward program. We got settled into our room and then the phone rings. It was the manager apologizing because he was new and didn't know. The room was clean but hot. I didn't know that the rooms did not have air condition. It was a hotter than a normal day in the area. We had one ceiling fan that made a horrible loud noise and two stand up fans in the room. It got up to 85 degrees in the room around 4 and was really uncomfortable. We had to leave so we could cool off. At night we had to open the window to get some relief. It wasn't bad but the road noise was not fun. Needless to say, we would not stay here again unless it was a cool day. I don't pay to stay in a hot room and be miserable. Clean or not. I think they should inform people that the rooms do not have air condition at time of booking. Dear Valued Guest, Sorry you did not find your stay enjoyable. I personally called up and asked if you would like a late check out and express check out. Nothing was mentioned about you being unhappy. I would've tried to accommodate you. Sounds like lack of communication. My sincerest apologies. Celebrating our anniversary and returning 19 yrs later. Stayed our first time on our honeymoon. Was still everything we expected 19 yrs later. Enjoyed the in room Jacuzzi. Continental breakfast was great! Dear Valued Guest, Thank you for the nice review. I am glad you had a nice anniversary and enjoyed our Jacuzzi tub room. We enjoy positive feedback and hope you choose us again in the future. "Convenient place for a quick ski trip"
Nicely located 5 miles away from Mt Hood meadow. Stayed for one night over a short weekend trip to Mt Hood to ski. The room is neat and clean with a light fragrance and a surprising open petit jacuzzi in the room next to our king sized bed. Checked in with a pet and was told the hotel no longer accepts pet since Jan. We thought it would be a bummer as we stayed at another BW of the same hotel chain in Sandy with our pet. We were sure it was said to accept pet on both Trip Advisor and Hotel.com better call in advance next time. After a fraction of a second thinking we would cancel the reservation the person at the reception was so kind to offer us a pet waiver. The stay so far so good. Two min walk from Mt Hood brewing co. a little bar restaurant for our craving before the second day in the snow! Dear valued guest, Thank you for the review. I am glad you had a nice visit at our property. Unfortunately we have phased out pets from this location. Glad we were able to make an exception for you during this visit. I hope you will come back in the future and visit us. Check your reservation and invoice very carefully. This hotel will charge you for anything they can to make a dollar. Terrible customer service and charge dispute resolutionprocess. I won't ever interact with them again. Dear Valued Guest, Sorry you had a bad experience with our hotel. On behalf of the staff I sincerely apologize. Nice, comfortable, quiet, clean motel. Farthest from center of town. Has jaccuzi and fitness room but no swimming pool. Microwave oven and coffee maker and refrigerator provided. Breakfast and pre-dinner food provided. Coffee, tea, cocoa, fruit juices also provided. Dear Valued Guest, Thank you for the nice review. Glad you enjoyed our stay and our amenities. Hope you will choose us again in the future. Some employees are dismally educated about Federal laws regarding Service Animals. When respectfully requested to go 'on line' and educate themselves, they became belligerent and attempted to refuse service. In all fairness, some very good employees did try and pick up the slack of this one dismally educated and authoritarian employee. Dear Valued Guest, Thank you for the review and bringing to light that we need education on the federal laws of service animals. This is all new to our property as we just recently changed our pet policy. Sorry for your inconvenience and hope to see you in the future. My husband and i had a wonderful stay here. The room was large and clean. Our room overlooked a creek. So fun being able to watch the snow pile up. the breakfast had a good variety and the snack in the evening was an added bonus. very good location for both Ski bowl and Timberline. I really enjoyed talking with the friendly lady that worked the front desk in the evening. She really made our stay enjoyable. I hope we will make this a yearly trip. Dear Valued Guest, Thank you for the great review. I am so pleased you enjoyed your stay and want to make us part of your yearly vacations. Looking forward to seeing you next year! 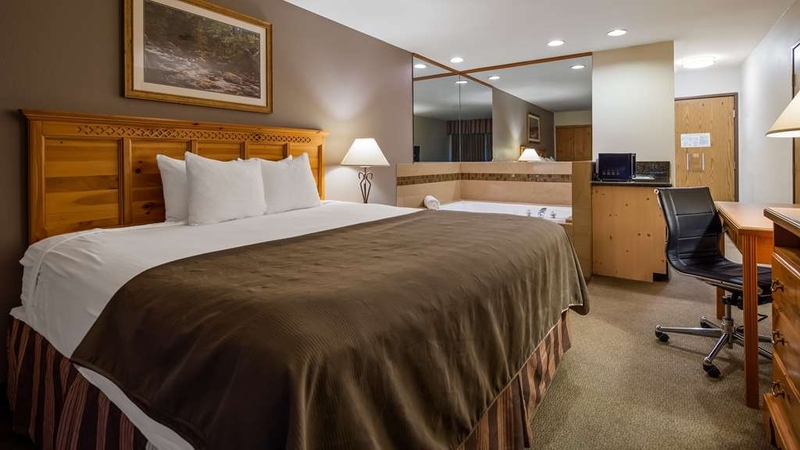 "Nice Getaway near Mt Hood"
I live in Virginia, My son lives in Portland, Oregon, he put us up for 3 nights at this hotel, very clean, beds comfortable, and the continental breakfast was great each day! Ham, sausage, eggs, all the milk and juice you could drink! 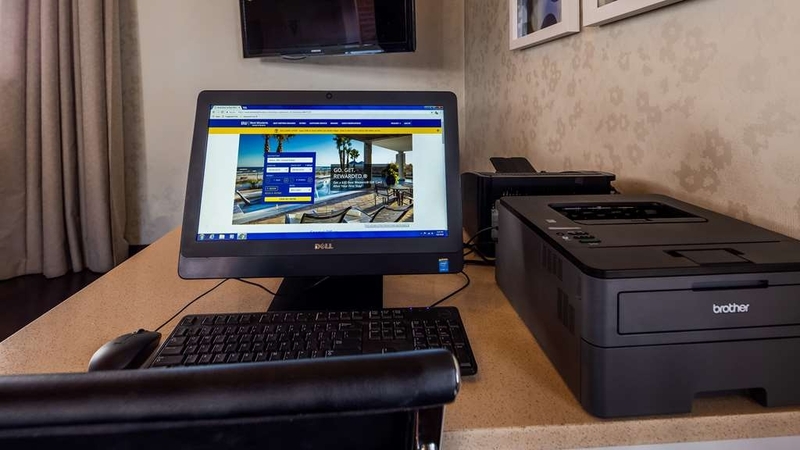 The front desk clerk, Zoe was the best, saying, we want you to feel like you're at home! Restaurant was right next door, but didn't eat there this time, all in all a real nice time and would definitely stay again!! Dear Valued Guest, Thank you for the great review. I am pleased you enjoyed your stay here and found my employees friendly. I hope you will choose us again in the future. Been visiting the slopes this season and I thought it would be nice to catch a morning Mt. Hood sunrise (HIGHLY RECOMMEND THAT TOO! OREGON IS TOO BEAUTIFUL). Would like to mention that from the get-go, especially the staff and even the guests were generous and friendly!! 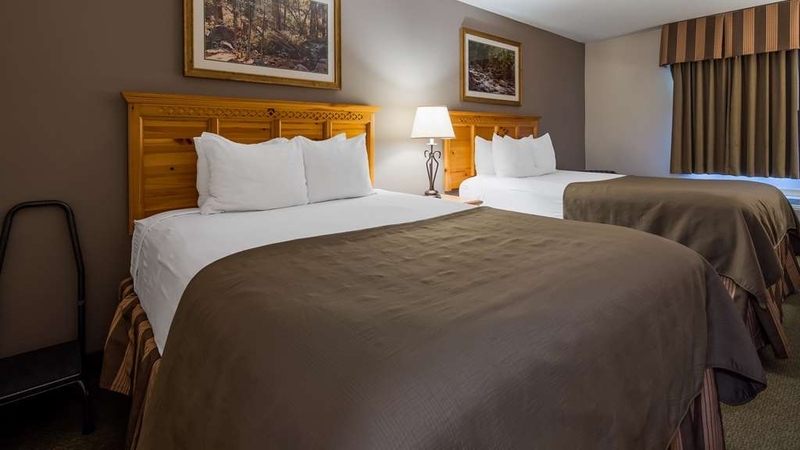 I've stayed in many luxury hotels, including the PGA golf resort, and I must say that this Best Western in Govn't Camp OR with out a doubt offers the luxurious package for a great value! They provided a dinner/snack to keep your belly happy and even the breakfast was good(I was able to fix up a brkfst bagel sandwich & juice). If you need something to do there is plenty near by including a brewery practically in the parking lot (next door). The hotel is a friendly environment for singles, couples and families. The breakfast might not be organic healthy but there is a lot to choose from. Mt. Hood snowshoe trails are right out the door and the mountain for downhill is 10 minutes away. "Caring staff and very comfortable room"
Zoe was at the front desk and helped us with every need. She let us know about discounts offered in the area to Best Western guests. She signed me up for the awards program and I immediately got benefits with an early check in when the room was available because I was a member. The hotel had a nice enough breakfast, the yogurt and fixins where the tastiest. The hotel even provide a little snack to take for the day of a water bottle, apple and granola bar. Jeanine helped in the even with a little crisis when my young son dead bolted the door and then fell into a dead sleep. I couldn't get in and started to panic after 30 mins of pounding. She called management and got us in all while being calm and comforting to me. Have stayed here many times and have always had good experience. We miss the old lodge decor and feel though. White chairs with a modern look don't really fit with a mountain ski hotel. We also could do without the egg "patties". The kids like the pancake maker. "Great affordable location on Mt Hood"
Great family destination! We found the hotel to be VERY clean. We enjoyed the wonderful breakfast. The hot coffee and cocoa in the lobby was nice also. The spa was very clean as were the rooms. Within walking distance to restaurants and shops. We took our grandkids and had a great stay. Our 4 year grandson said he was never leaving! We loved the view of ski bowl lights at night. 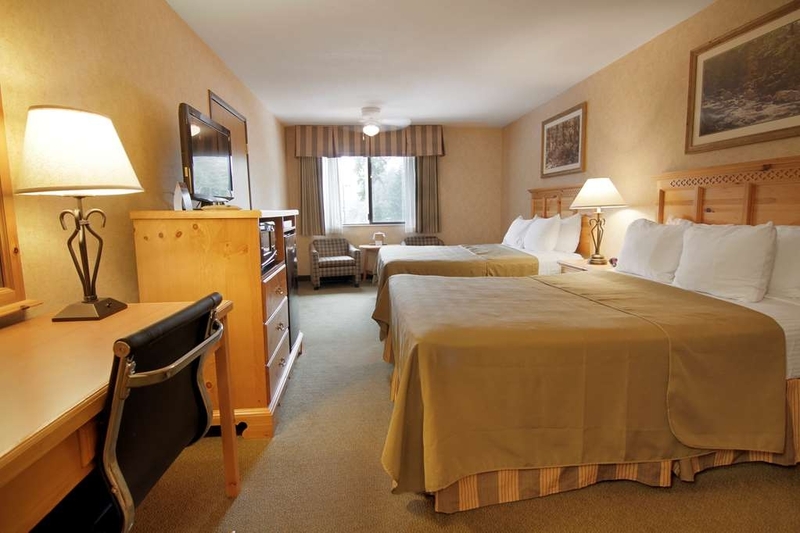 "Great place for a night stay at Mount Hood"
A very well located Inn in Government camp near to all resorts. It is not expensive and value for money. Good for family. Breakfast included. It is sumptuous and if you need a night's halt this is the place. Dear Valued Guest, Thank you for the nice review. Glad you enjoyed your stay and found hoe centrally located we are. Come back and see us in the future. "Ski , hot tub and eat a big breakfast at Gov.Camp Best Western"
Dear Valued Guest, Thank you for the great review. I am glad you enjoyed your stay here and utilized the hot tub and great continental breakfast we offer. If we can be of assistance in the future let me know. "Better than Expected and Great Location"
Dear Valued Guest, Thank you for the nice review. I am glad you enjoyed your stay here. I am happy to hear you found the staff great. I value your opinion and any recommendations you have to better serve the guests. Hope you choose us again in future travels. "Nice and close to the skiing"
We stayed in this hotel for a New Years trip. We upgraded to king with a garden tub while making our reservation. The room was very roomy. The tub was very nice. We were on the front of the hotel towards the main road and had a nice view. The parking is limited. We walked everywhere so it didn't cause a problem for us. There was no fee for parking or the wi-fi. It is right across the street from Ski-Bowl which has skiing, a bar and a restaurant. The area was super busy for New Years. The hotel is walking distance to Mt. Hood Brewing Company, which is nice. The only complaint is the water pressure fluctuates like crazy and the breakfast is super crowded with little seating. But the breakfast is free and offers lots of choices.Also, there are only two towels offered, so if you are traveling with someone else and you need two towels, request another one. Dear Valued Guest, Thank you for the nice review. I am glad you enjoyed your stay with us and were able to upgrade to a hot tub room with a nice view. I do apologize for the lack of parking and water pressure. During the busy season several people drive more than 1 car and we have limited spaces for our guests. I hope to see you in the future. "The staff went above and beyond on a very icy night"
This Christmas week, my family landed very late in Portland, and by the time we got our rental cars (2 cars, 5 people, lots and lots of luggage and ski stuff), got on the road to Mount Bachelor/Bend, OR after midnight. The rental car desk advised us poorly, and soon we were on roads that were dark, dangerous and without consistent cell service. I found the Best Western online, who said that they were completely booked, but would be happy to help us find a room. (we had at least 3 more hours on our trip, which I made the decision NOT to do.) When we arrived, tired, stressed out, and very rattled, the staff at the desk, Trysten and Priscilla tried a number of magic tricks, resulting in one available room, snacks, and recommendations of where to get tire chains in the morning. The room was very clean, the shower hot, and very importantly, the beds comfortable! The next morning, in the light of day, we were greeted with a great breakfast, clear roads, and directions to the closest service station. The stop was not part of the plan, but thank goodness they were there. Thank you Trysten and Priscilla! Your kindness was appreciated and will not be soon forgotten! Dear Valued Guest Thank you for the nice review. I am so glad my staff was able to assist you on a sold out night. Glad you were safe and warm for the night and were able to get a hot meal in the morning. If we can ever assist you in the future let us know. "Great fun in the snow"
Great place to stay and play in the snow for young kids. The front yard of the hotel is like a mini-snow park for snowman building, sledding, and just playing with the snow for young kids. We had a lot of fun! Great place to go. Rooms are good, had one smelly bed cover but everything else was ok. Breakfast they offered was not the best quality but better than other places . Overall stay is great for the money. Dear Valued Guest, Thank you for the review. I am glad you enjoyed your stay at our property. I look forward to you staying with us in the future. "Great location, nice price, but not very friendly"
My wife and I and 2 teenaged daughters spent two nights there for a ski trip. The location was excellent and the price was good. But there were many little problems that left us disappointed in the end: burned out bulb, previous renters left behind items, and a staff that, with one exception, seemed uninterested in any of issues mentioned above. The food was okay, but the layout was odd, ... for example the butter and butter knive were nowhere near the toaster, so people were constantly milling rather than moving through the line. Dear Valued Guest, Thank you for the review. I am sorry we didn't meet your expectations. We want feedback so we can make improvements. Hope to see you back in the future. "Location location and comfort "
Make sure to upgrade to the jacuzzi room! Comfortably guys two people. It's very luxurious after a day of skiing - Mt. Hood is only 20 minutes away. They are right across from the Brewhouse so you can stumble back to bed safely ;) excellent value for what you get! Thank you for everything! Dear Valued Guest, Thank you for the nice review. I'm glad you enjoyed your stay with us. I hope you come back and stay in the future. "Vary nice staff and clean"
Me and my girlfriend stayed there for one night. The staff was vary nice and helpful. There are many complimentary survives such as free wifi and on demand movies, hot chocolate and coffee 24/7, breakfast and a pre dinner snack. Also there is a vary nice brewery/bar and grill just on the other side of the parking lot. Do yourself a favor and book through TripAdvisor it saved me about 40 bucks. Dear Valued Guest, Thank you for the nice review. I am glad you enjoyed your stay with us and found the staff friendly and helpful. We value your opinion and ant recommendations. I hope you come and stay with us in the future. If you can't stay at Timberline, this is a good back up. Clean, close to skiing, convenient, clean. Ski lockers, hot tub and some in rooms, kitchen prepared foods for breakfast, some covered parking (free) and close to village. Dear valued guest, Thank you for the review. I am glad you enjoyed your stay here and found our rooms clean and breakfast was satisfactory. Please let us know if there are any improvements we can make. We hope to see you in the future. "Great location, friendly staff, comfortable rooms." Clean, comfortable room & friendly staff. WiFi worked well. The location is excellent, just off the main road & next to a Brew-house that has good food & OK beer. The breakfast area is not in a good place, off the main lobby & right next to the door. The breakfast choices were not that good: There was only whole milk for breakfast, no skim or soy for folks with lactose issues. No sugar-free syrup for the pancakes, either. Dear Valued Guest, Thank you for the review. We value your input as we try to improved our hotel and make your stay more enjoyable. We are in the process of improving our breakfast options. Unfortunately the breakfast area is small area . We hope you will choose us in the future. everything was very good, staff was great, beds were comfy, having a pool would have been great for the kids, and for parents too. 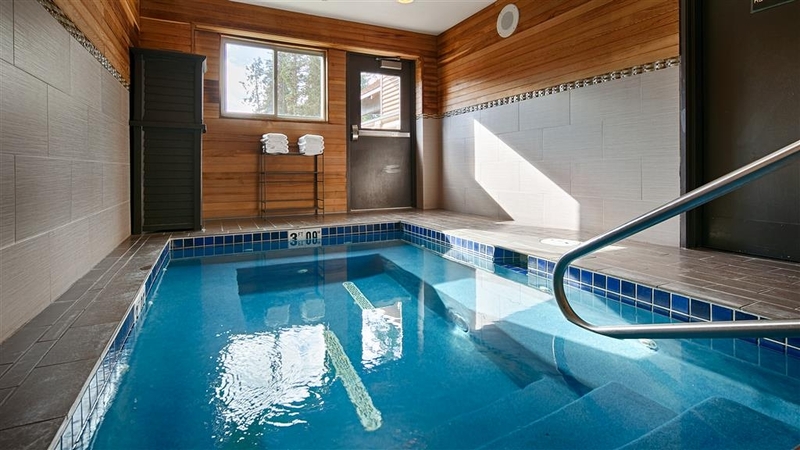 Close to town and bunny hill, fireplace in lobby very inviting, covered parking very convenient, ski lockers also very helpful..
Dear valued guest, Thank you for the nice review. I am glad to hear your stay with us was enjoyable, and the staff was friendly. The fire is a favorite in the cold weather. We value your comments as we are constantly looking for feedback on ways we can improve our hotel. I hope you come back and stay with us in the future. "Over Priced and Under Maintained"
Dear Valued Guest, Thank you for the response. I'm sorry our hotel did not meet your expectations. If we can be of assistance in the future let us know. "Good old Best Western , no problems , no complaints , nice room good breakfast"
Wound up near Mt. Hood in the middle of the worst rainstorm we've had in a year or so , lanes had standing water , drops were bouncing up close to a foot! Saw the Best Western sign , and decided to stop - Nice room , decent price , good breakfast , no problems ..
Dear valued guest, Thank you for the nice review. I am glad you enjoyed your stay with us and got out of the rain safely. We are constantly looking for input and advice so we can offer our guests to most pleasant stay. We look forward to seeing you in the future. "Pleasant stay, close to downtown Gov't Camp"
We found a great deal on Expedia. Really nice stay, friendly staff, clean rooms, good breakfast , and a short drive or walk to great restaurants and bars in Government Camp. Even though it was not ski season, I'm betting this would be a perfect place to stay during ski season. Dear valued guest, Thank you for the review. I am glad you enjoyed your stay here at the best western. We are centrally located here with lots of hiking trails and restaurants nearby. We value your opinion and feedback. Hope to see you in the future. The hotel was good, the receptionist was great and helpful, the hot breakfast was excellent. Price is also reasonable. We arrived in the hotel around 8 in the evening. Everything went well. We did dinner, laundry and went to sleep. Unfortunately there was a problem with the water (plumbing) when we woke up around 8 in the morning. No water supply at all up to check out time. But the staff are very helpful in providing us with water bottles. A plumber was working to solve the problem as we left the hotel. Dear valued guest, Thanks for the nice review. I am glad you enjoyed your stay despite the water issue. We are glad that got resolved quickly, those situations are out of our control so thanks for understanding. I am happy the front desk agent was helpful. We take pride in having friendly and knowledgeable staff available 24 hours. I hope to see you in the future. Dear valued guest, Thank you for the nice review. I am glad you enjoyed your stay here with us at the best western and the staff was helpful. During our renovation period I am glad you didn't experience any dust or noise. We are trying to make improvements during our slow time of year. We look forward to positive comments and feedback. I hope you will come stay with us again in the near future. Although being renovated,construction noise or dust was not a problem Helpful, pleasant staff. Breakfast had many choices of food. Far enough from Hwy 26 that traffic noise was not a problem. There are some covered, indoor parking spaces which would be nice in winter. Dear valued guest, Thank you for the nice review. I am glad you enjoyed your stay here with us. We are trying to get some renovations done in the slow time before our busy winter season hits. Thanks for understanding. I am please the staff and breakfast choices met your expectations. We are always looking for feedback so that we can better improve our guests stay here with us. I hope you will choose us in the future. Our stay at the Mt. Hood Best Western was very enjoyable. The staff members were very personable and helpful. The room was comfortable, especially the bed. Breakfast was far superior than we have experienced at other chain hotels. The spa was an added attraction! And you couldn't beat the location - near beautiful Mt. Hood. Dear valued guest, Thank you for the great review. I am glad you enjoyed your stay with us and found the staff and amenities. We love to hear feedback as we are constantly wanting to make improvements. I hope you choose us again in the future. We had a spa room on the lower level. There was another spa room directly above. They filled and drained their spa 3-4 times over a 4 hour period, ran the spa jets for very long times until after midnight and had the TV really loud and by the sound of the music it was an adult movie. The spas on the second floor are very noisy on the first floor. There are not any hours posted so I didn't feel like we had a right to complain. Would not stay here again. Dear valued guest, Sorry to hear you had a bad experience at our hotel. If you would've called down to the front desk during your stay we would have been more than happy to contact the other room or move you to a different room that was more quiet. We are more than happy to accommodate our guests need and address the complaints. Unfortunately since you never mentioned any of your complaints to the staff or management we were unable to help the situation. Quiet, clean cozy ski lodge appeal. Nice, new rooms, small hotel overall. There were light appetizers around 5-6pm which was nice, & a continental breakfast that was a little better than the norm. We visited the Timberline Lodge (10min away) for dinner & then had a beer at Mt Hood Brewery which was next door the the hotel. Dear valued guest, Thank you for the review. I am pleased to hear you enjoyed your stay with us. We take pride in our property and appearance of the hotel and the quality of the breakfast items. We value feedback and comments so we can continue to make improvements. We hope you will stay with us in the future. The nicely furnished Best Western was a decent value and we were pleased with our stay overall. The bed wasn't the best, but the pillows were good and the hairdryer and HVAC system in the room were excellent. Also, I like that we could open the window for fresh air. Dear valued guest, Thank you for the review. I am pleased that you enjoyed your stay here with us. We like comments and feedback so we can continue to provide excellence service to our guests. We hope you choose us in the future.